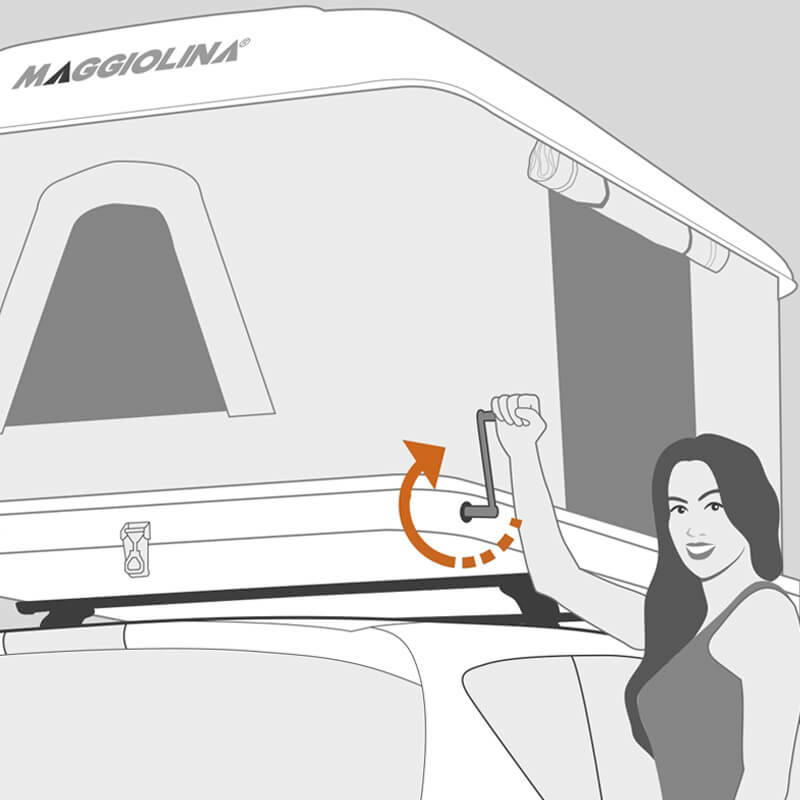 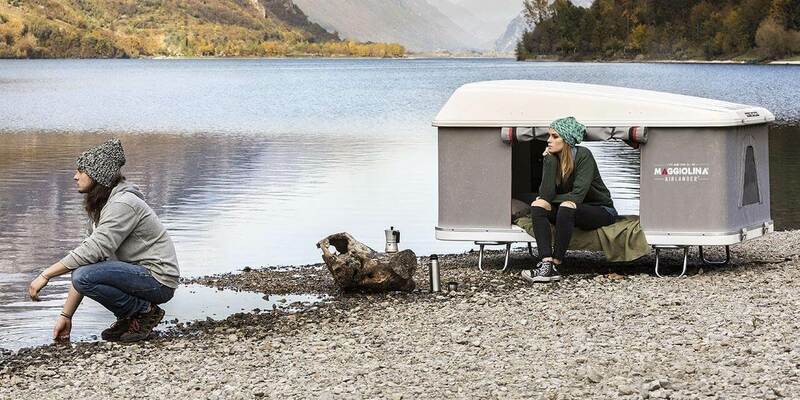 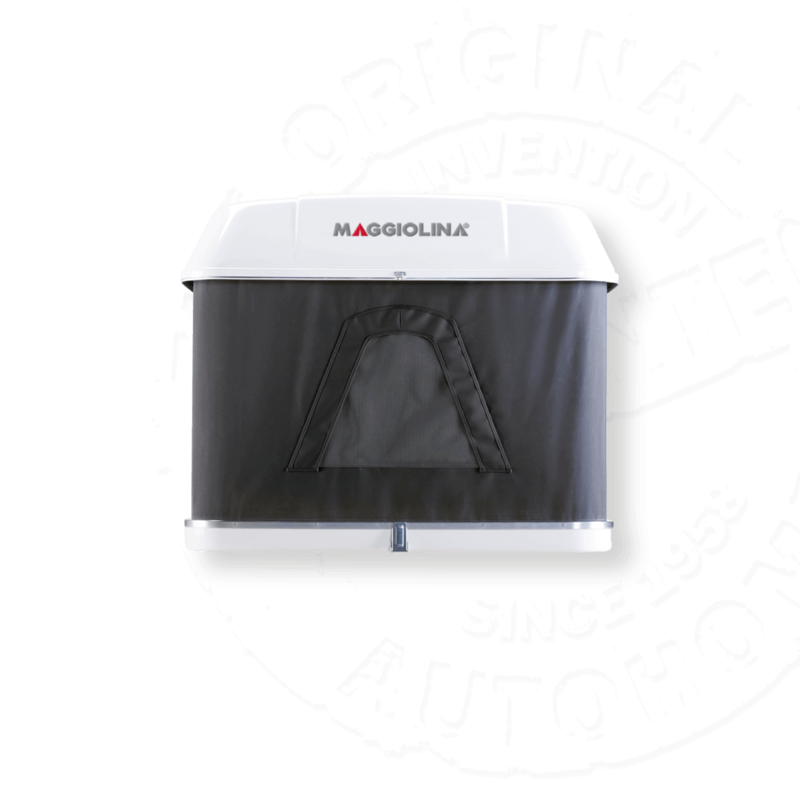 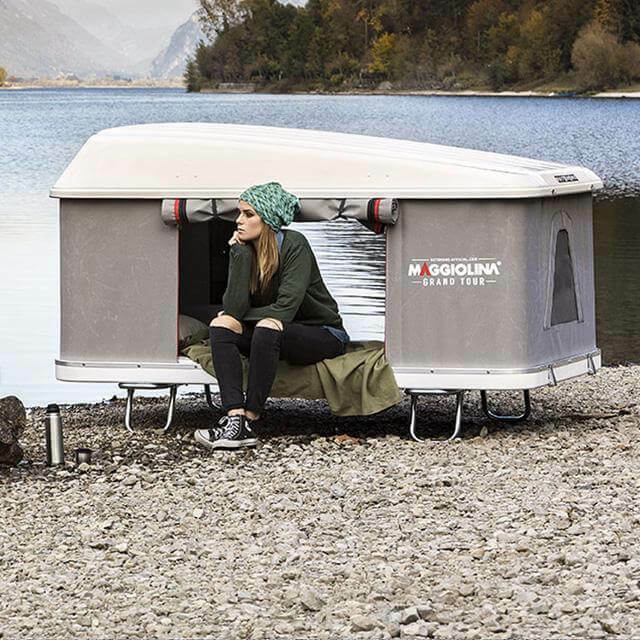 Maggiolina Extreme is a new and revolutionary roof tent for lovers of off-road adventure: with a new design and new colour; it incorporates a new style roof rack for all your sporting or essential travelling equipment making it ideal for weekend trips, holidays and adventures on and off roads the world over. 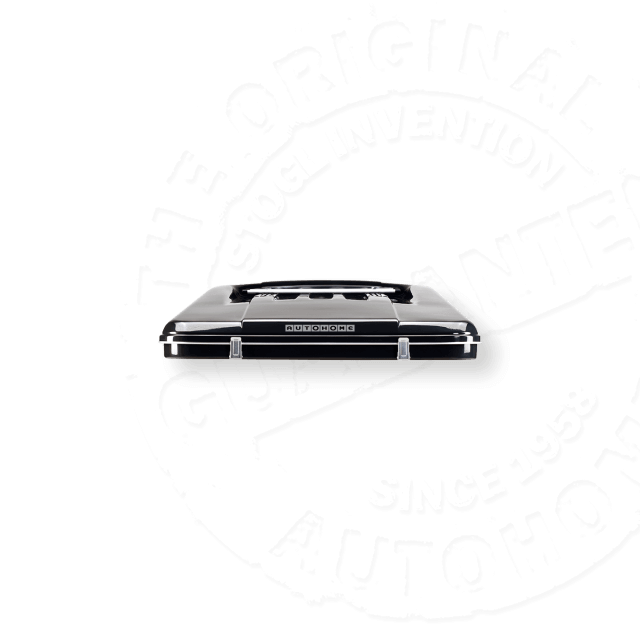 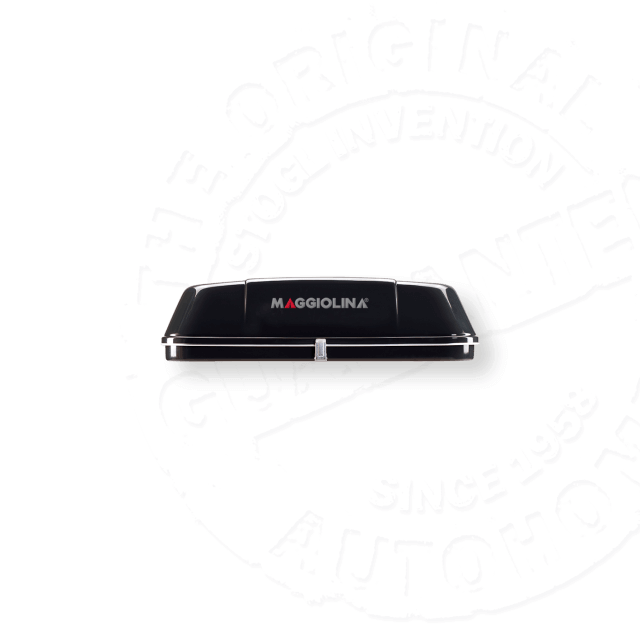 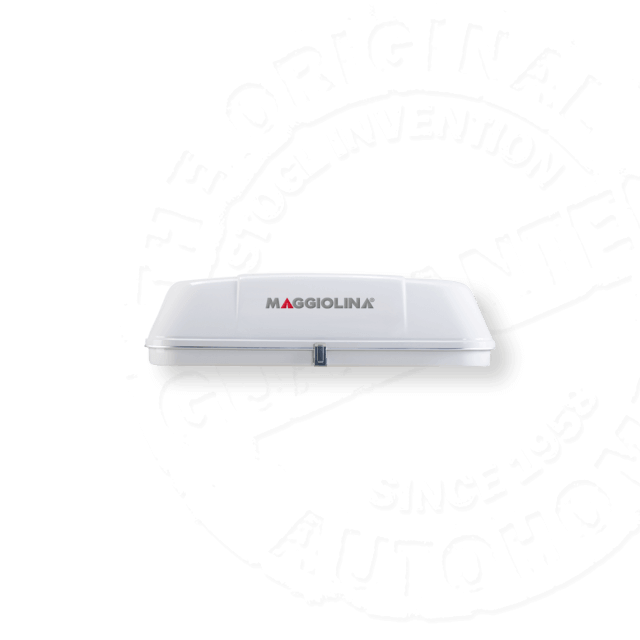 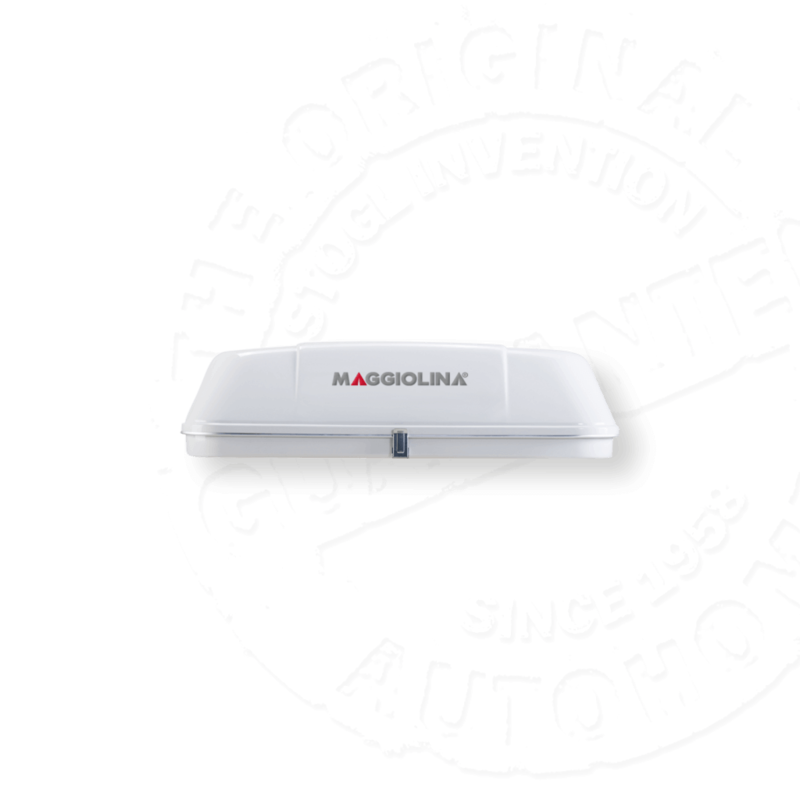 With Maggiolina Extreme, roof tents take on a new meaning: freedom, strength and unbeatable comfort. 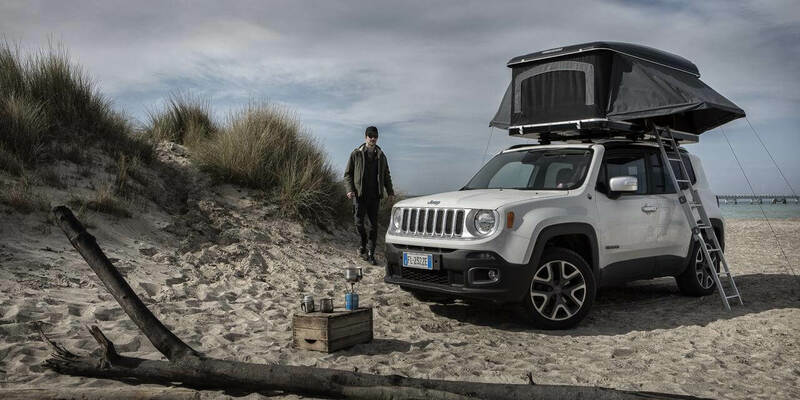 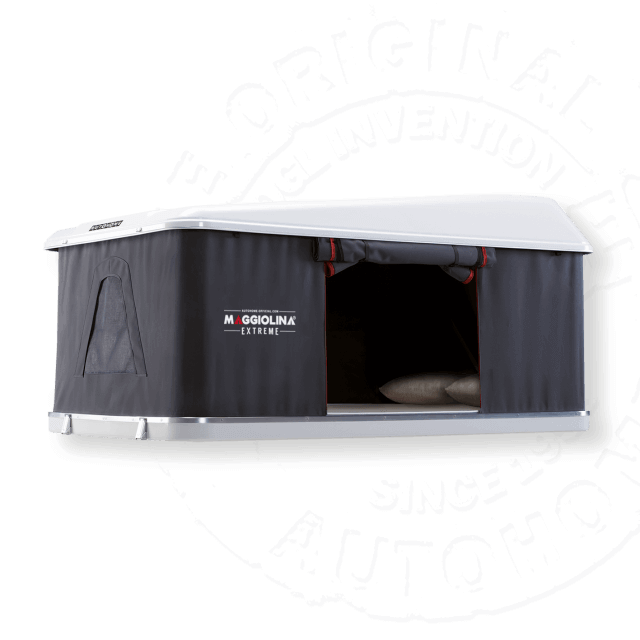 For a holiday, weekend away or an extreme journey, Maggiolina Extreme is a roof tent for any occasion: the spirit of freedom and adventure. 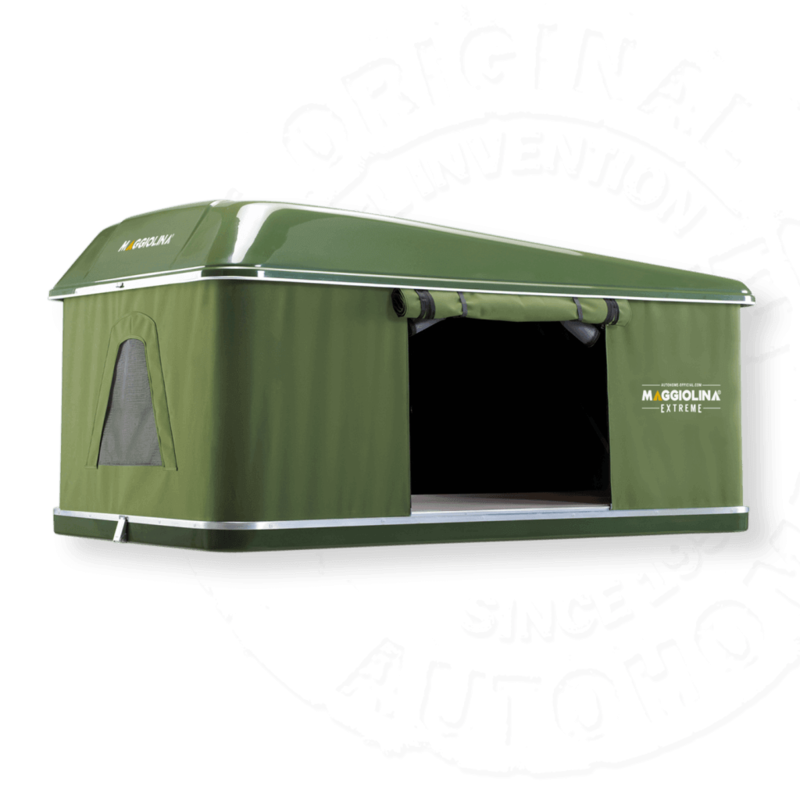 exclusive Australian line. 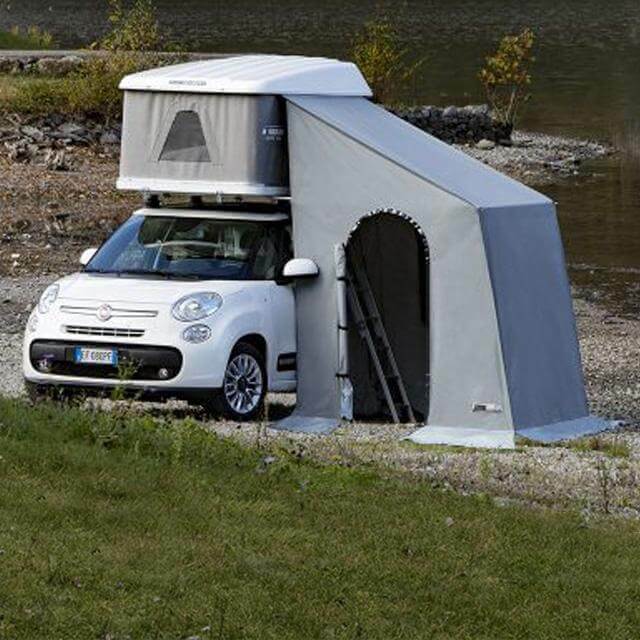 It’s become part of the Autohome range. Colours: Black Storm Shells and Carbon Colour fabric. 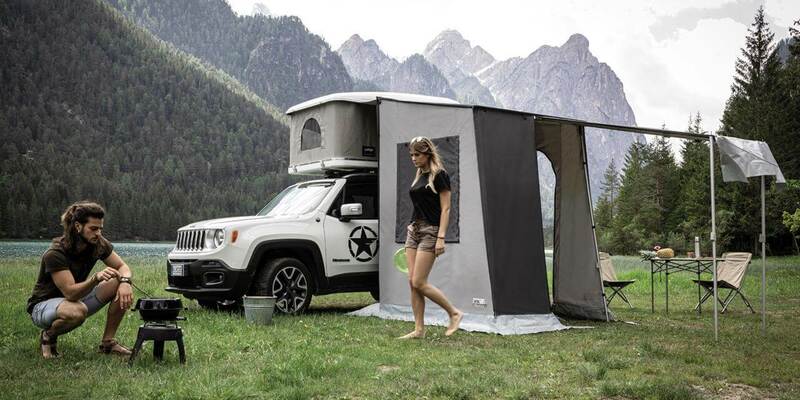 È il modello ideale per chi vuole mimetizzarsi nella natura: ambientalisti, tecnici di ripresa e appassionati di safari fotografici. 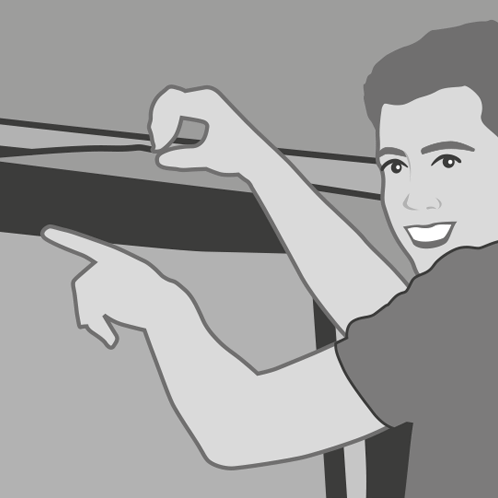 Si tratta di una variante del modello Extreme: il colore antiriflesso dei gusci, la tinta dei tessuti e le finiture interne sono all’insegna della discrezione e del mimetismo: un dettaglio che farà felici gli amanti del bird-watching, particolarmente attenti a non spaventare gli animali. 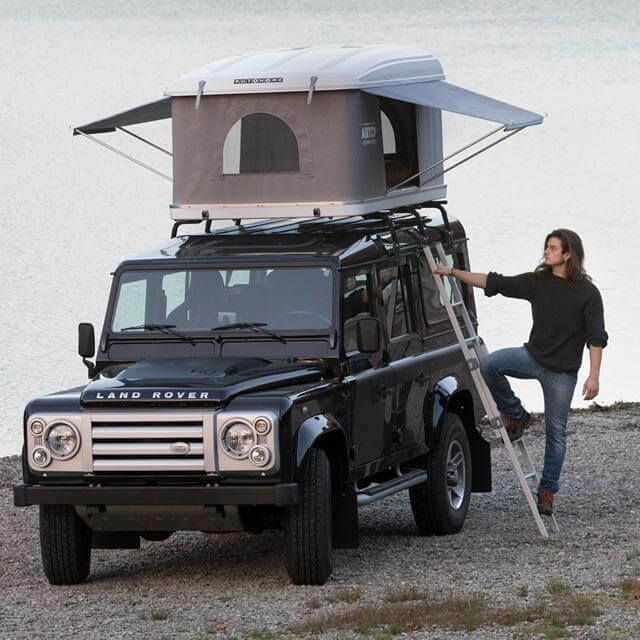 The exclusive model with roof rack attachment built into the top. 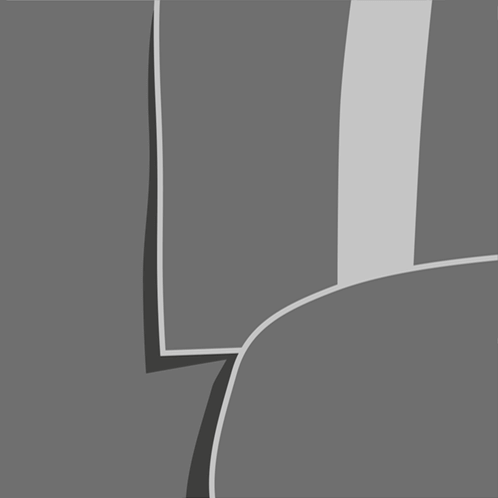 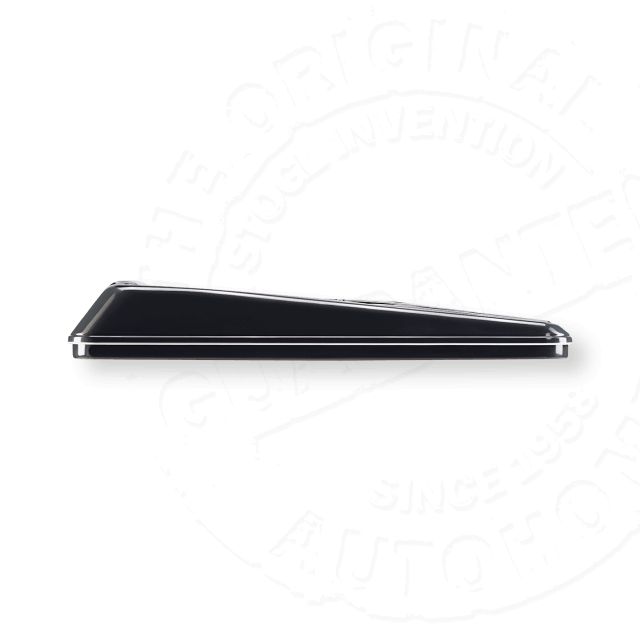 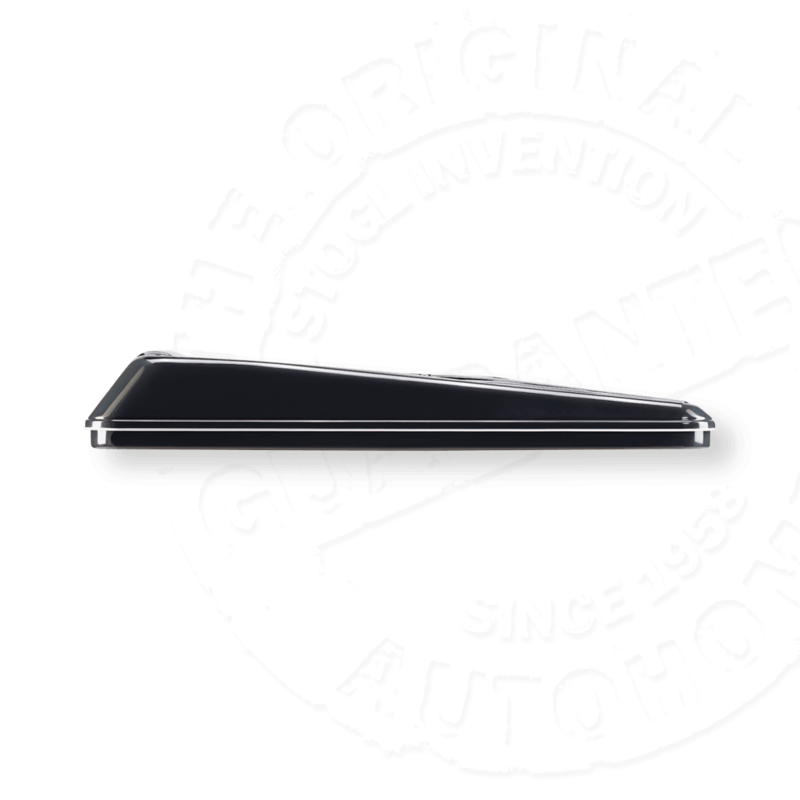 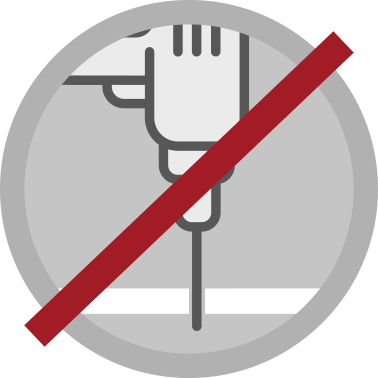 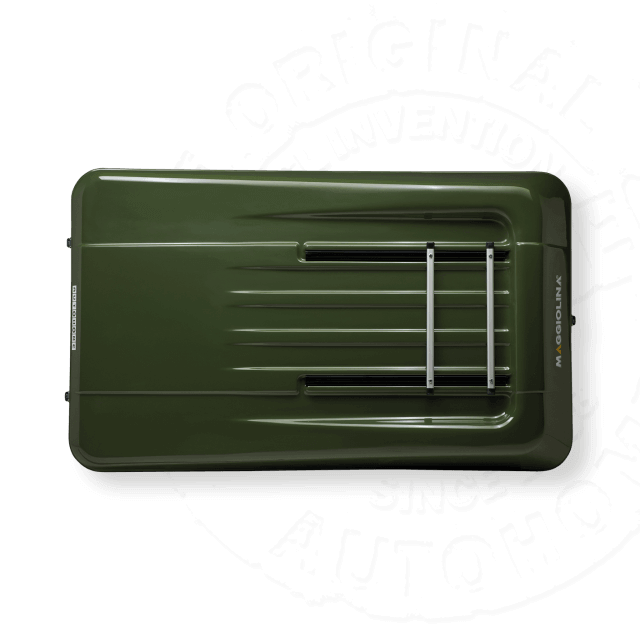 items such as canoes or surfboards without any additional attachments. 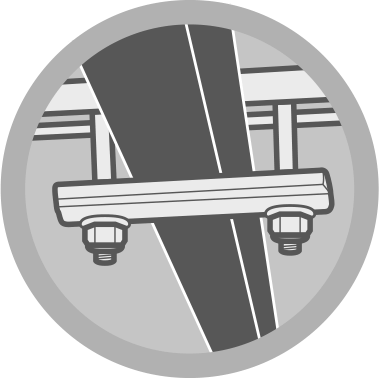 Max 25 kg (see the istructions). 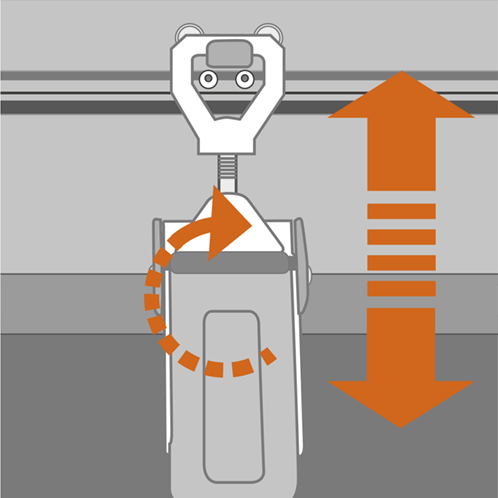 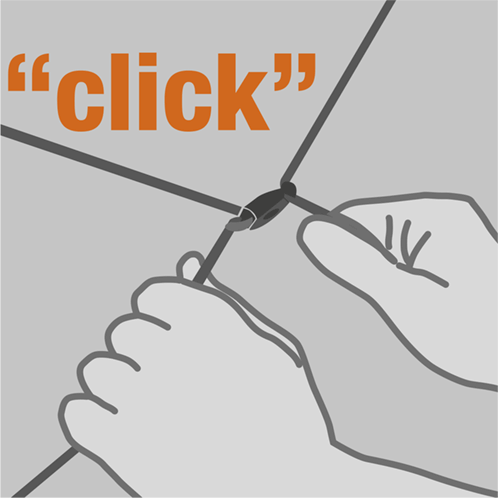 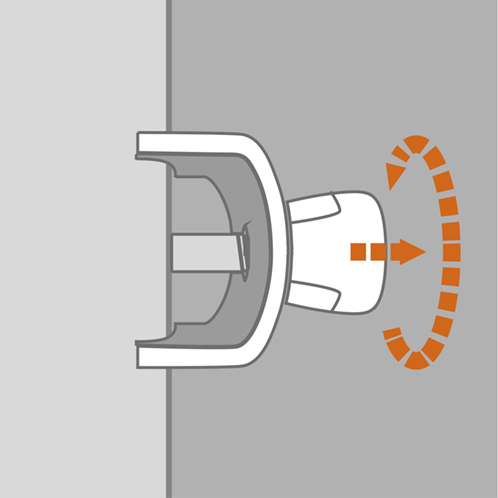 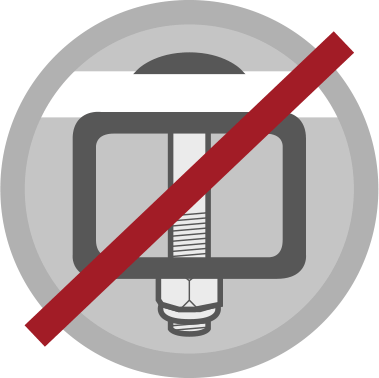 9 - As standard, the automatic spring device blocks the ladder when it is open. 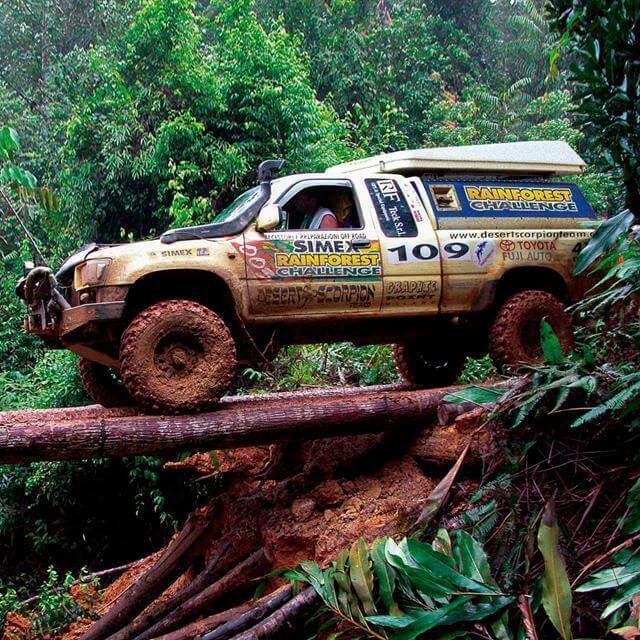 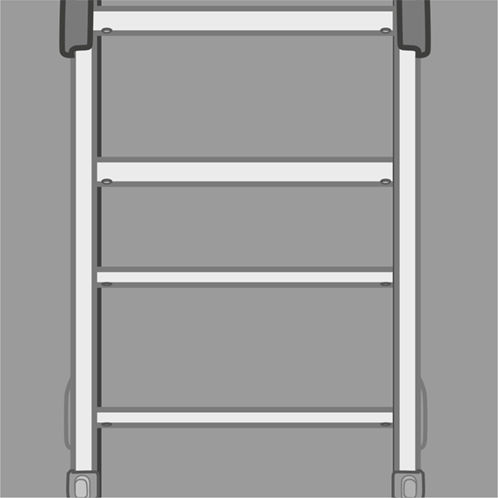 The risk of slipping is prevented and the ladder is stable and safe on any terrain. 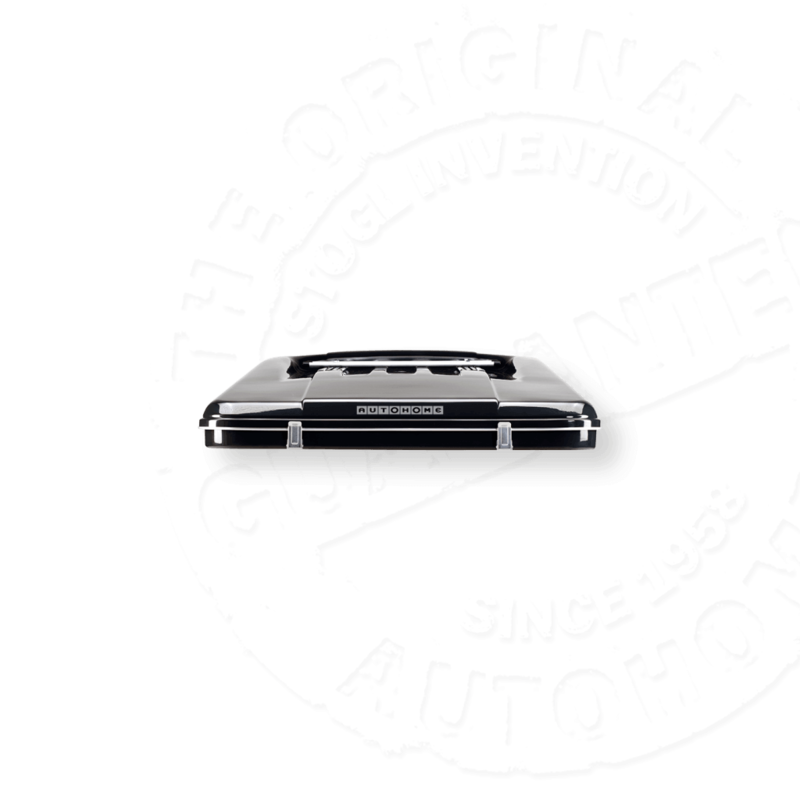 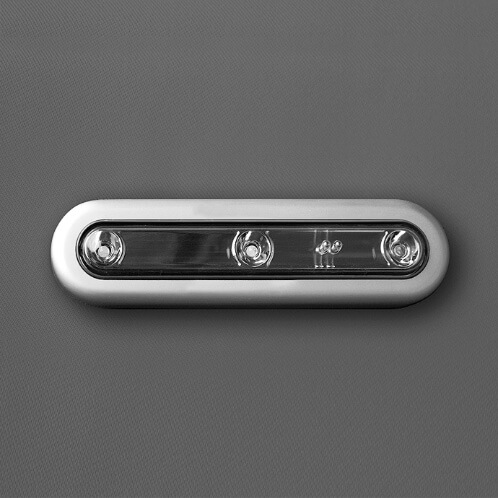 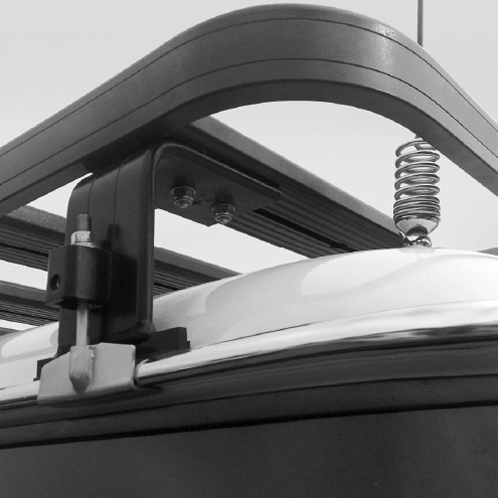 Top of range versions, further equipped and with more optional than the classic version. 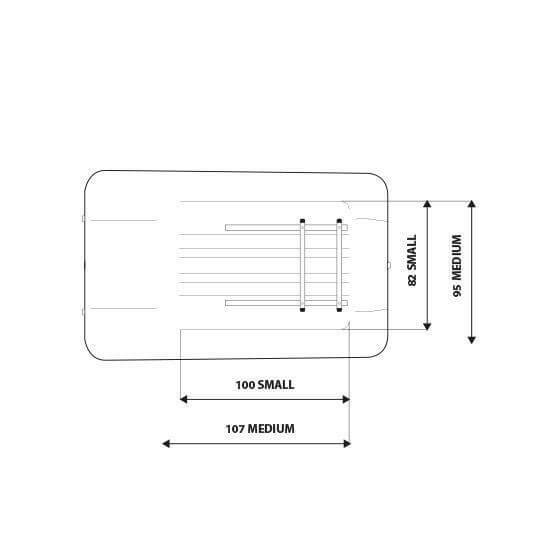 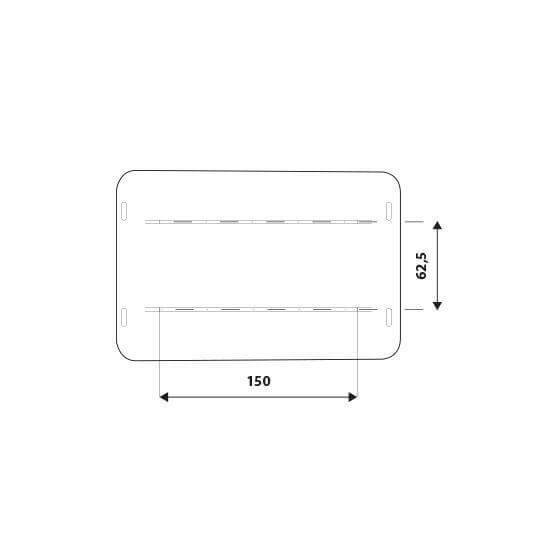 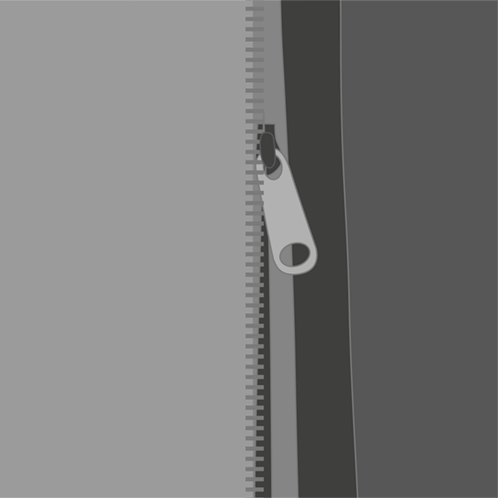 10 - 11 - 12 - Entry and exit is made using either of the 2 doors* with vertical zip fasteners. 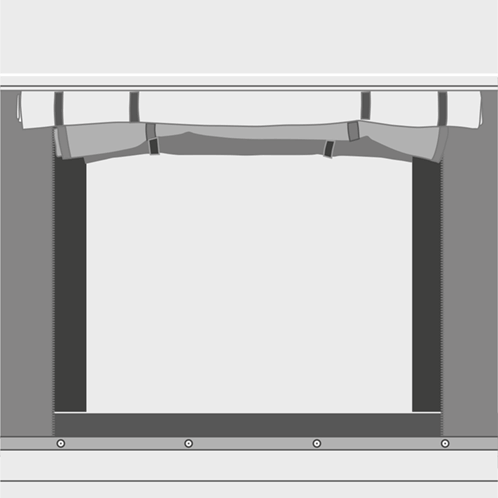 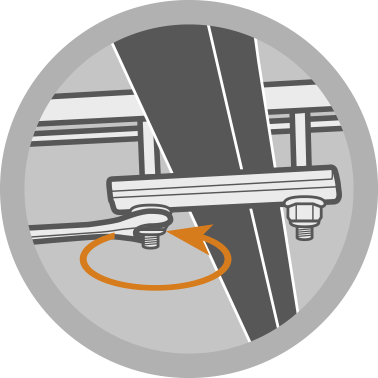 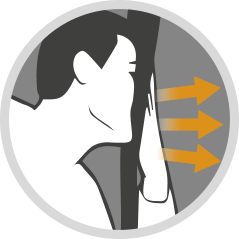 A second, additional, arc zip fastener is also fitted for partial door opening giving privacy and ventilation which can help eliminate condensation. 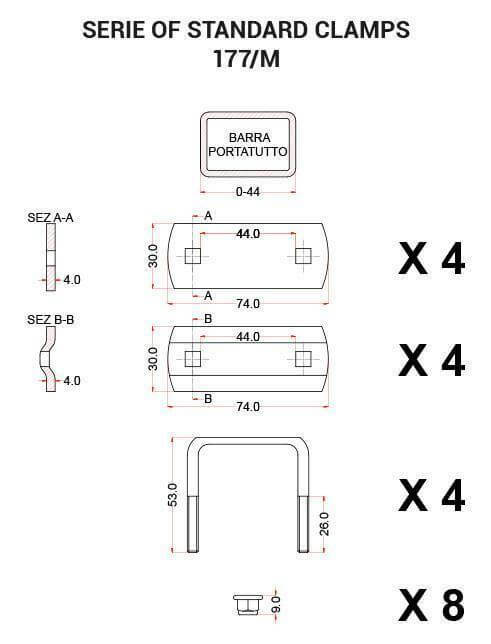 superiori delle porte, diventano anche efficaci prese d’aria anticondensa. 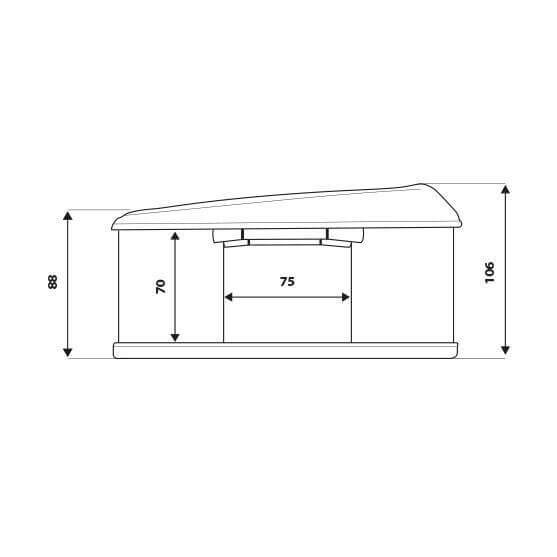 17 - The series with all the top of range equipment is characterized by the possibility of additional load on the shells. 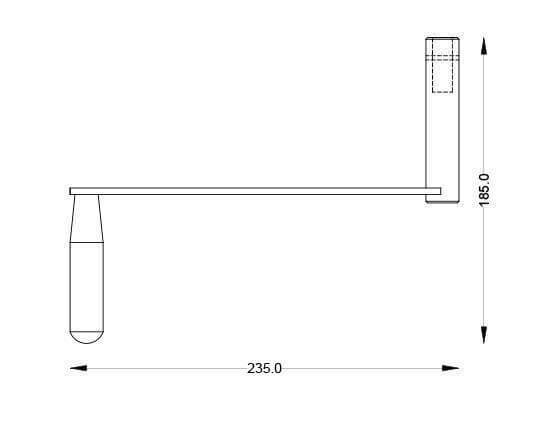 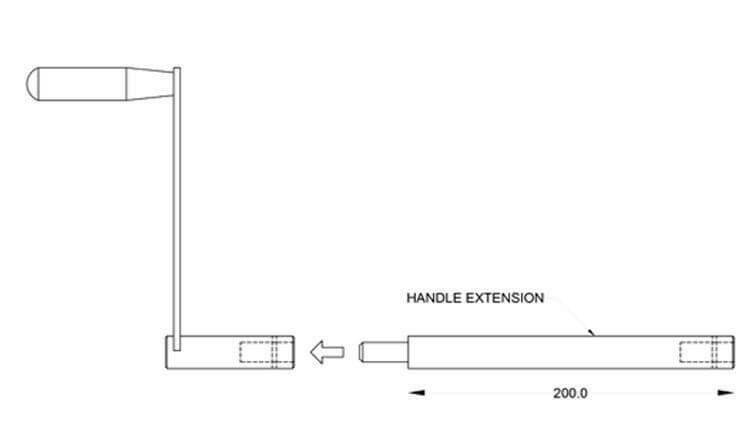 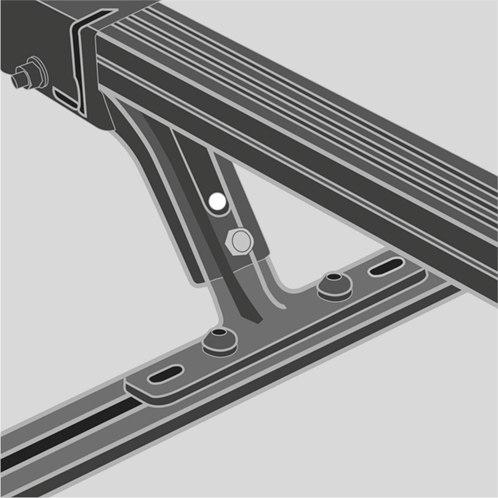 18 - 19 - 20 - The special supplied bars are removable and adjustable according to the loads being carried. 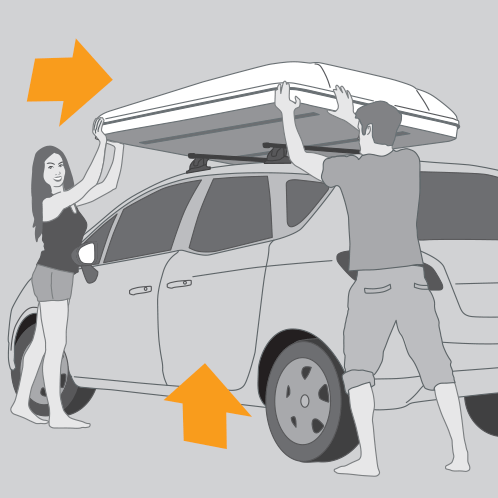 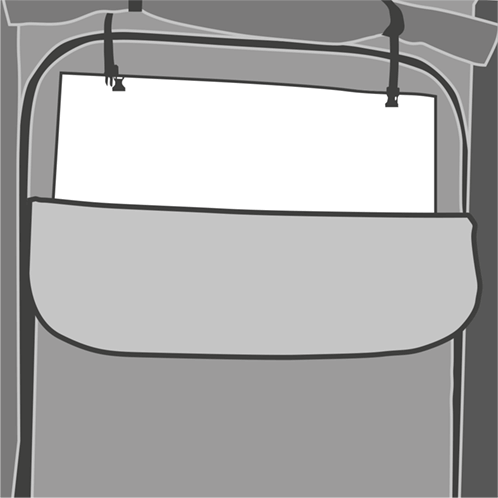 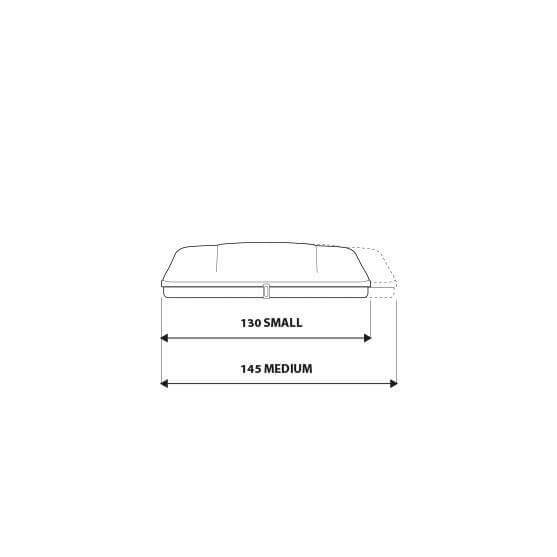 All large items (camping tables, chairs etc) can be perfectly stored on the roof whilst bed linen etc can be stored safely inside the outer shells. 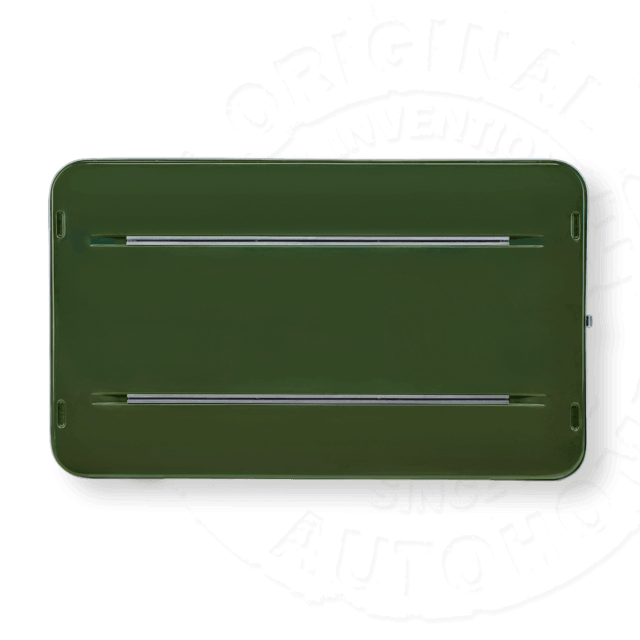 On request, various and specific kit fix sets can be fastened to the “C” shaped channels integrated in the shell. 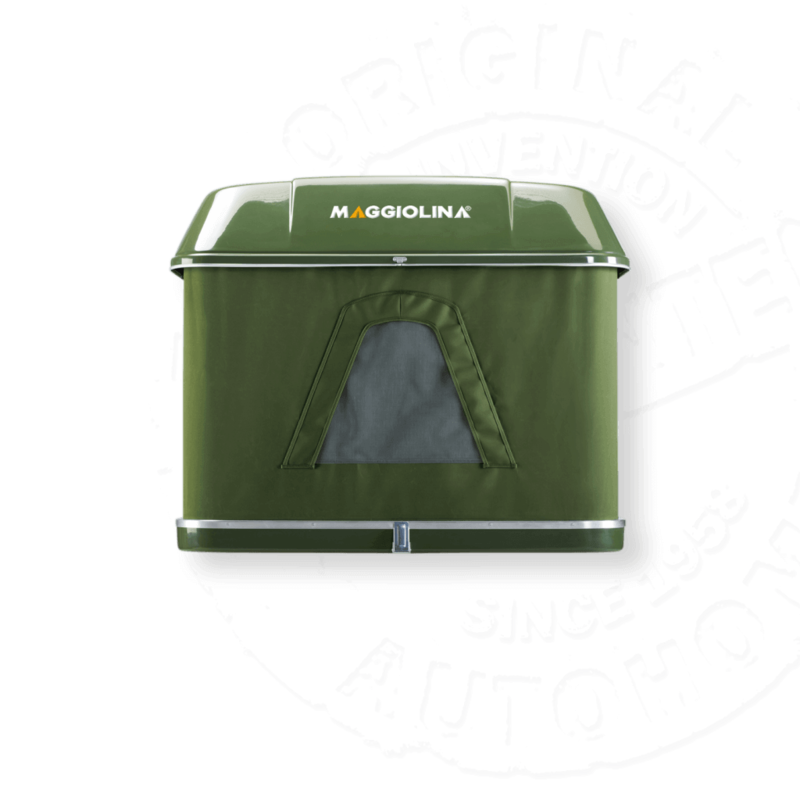 Approach the tent, take a flap of tissue and press it firmly against your mouth with one hand and breathe out hard. 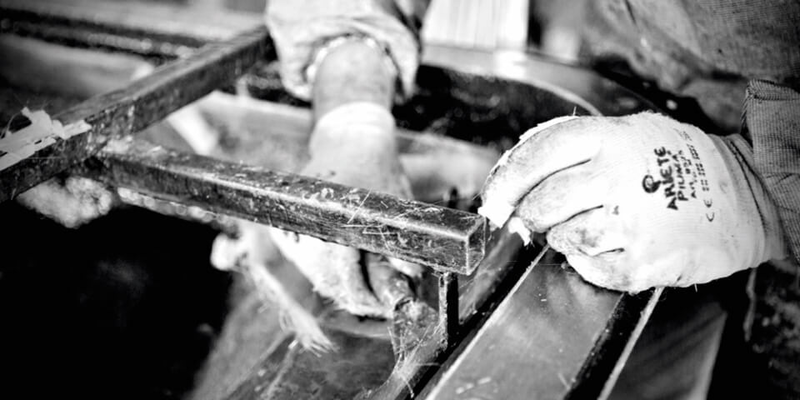 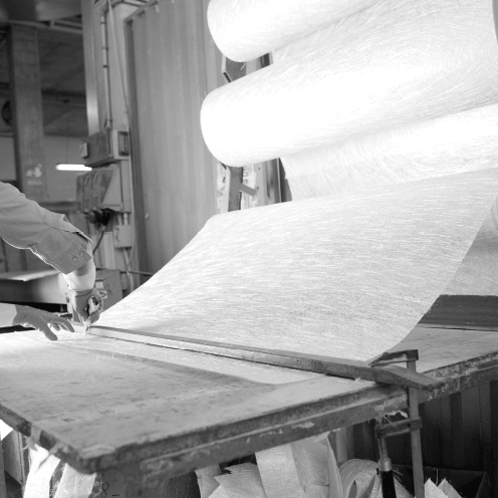 If the palm of your hand feels the air passing through this means that the fabric is breathable. 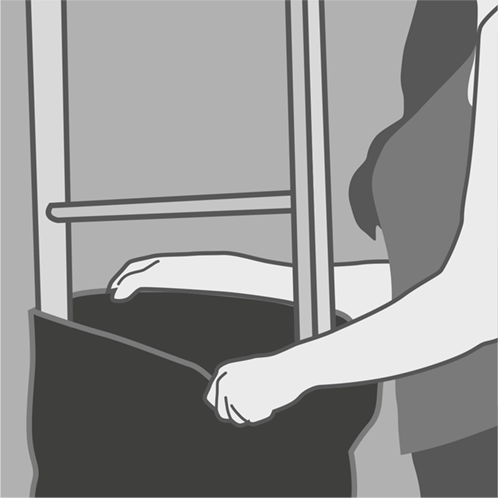 Hot summer nights, no drafts of air or partly open windows to combat the humidity. 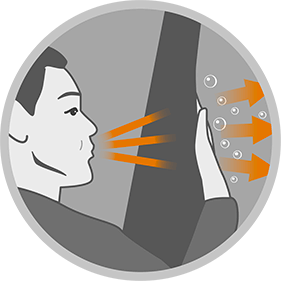 With a breathable fabric you never feel suffocated and can always breathe deeply in all conditions. 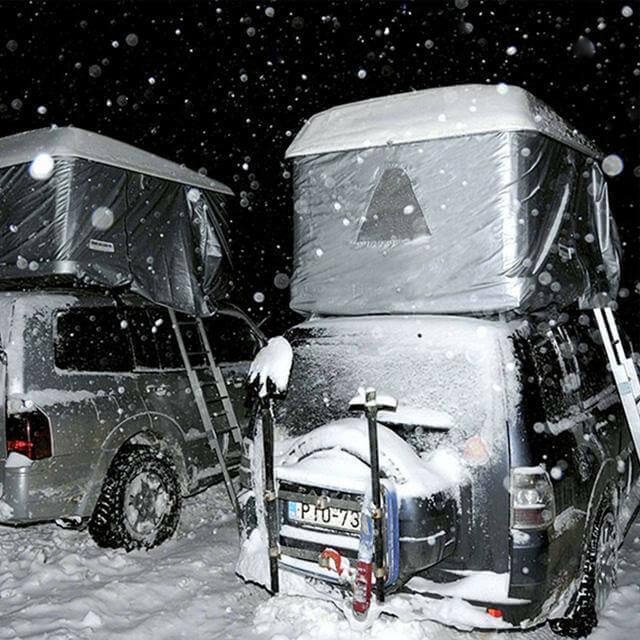 We cannot control the weather, however we can build in features to ensure your comfort is assured in extremes of climate. 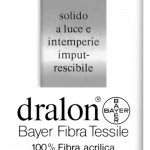 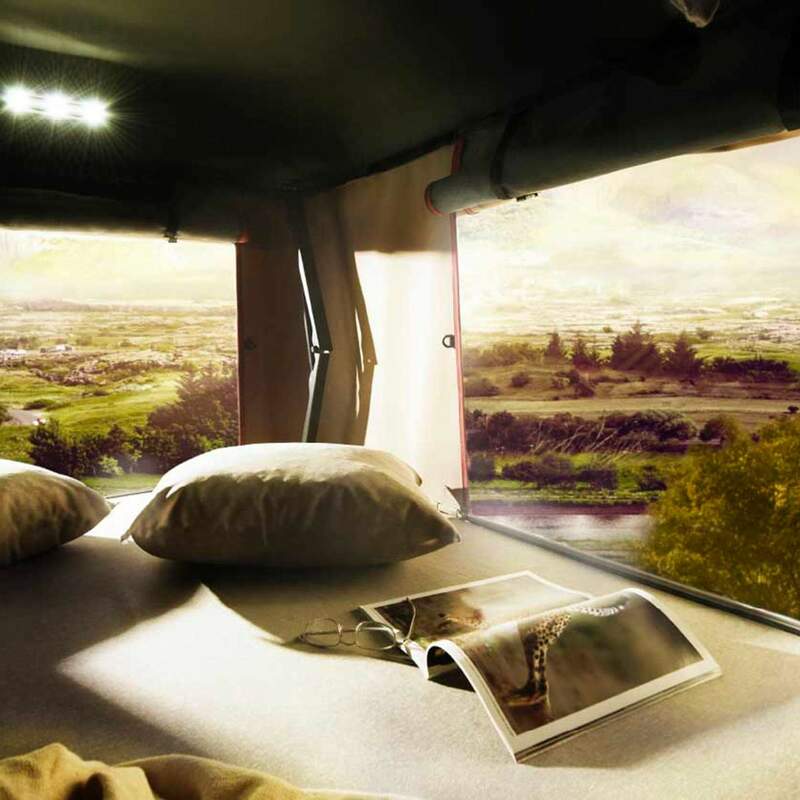 Autohome use Dralon® from Bayer Textiles. 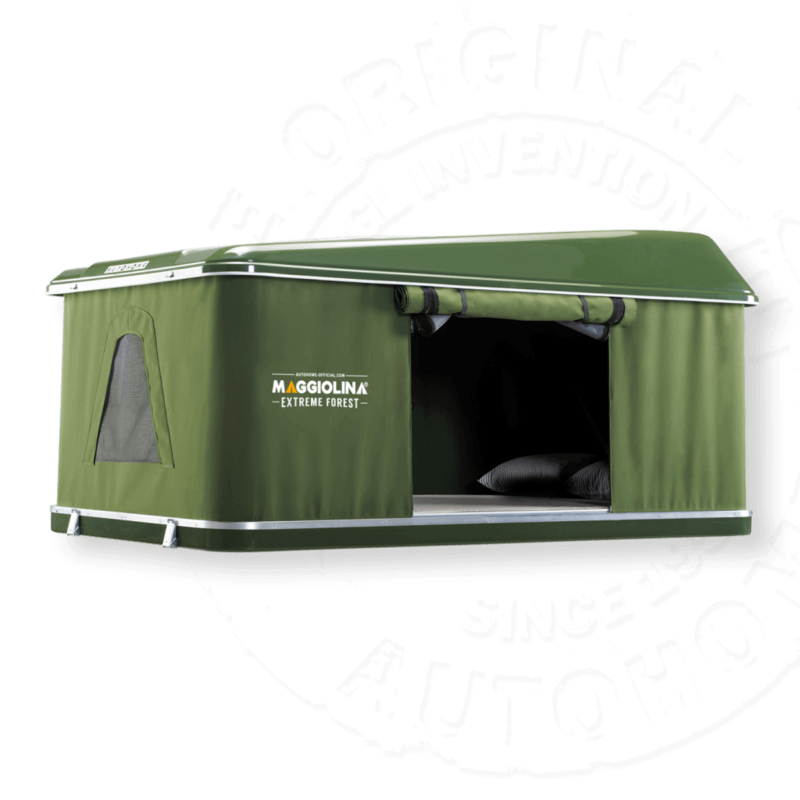 Dralon is completely waterproof, windproof and breathable. 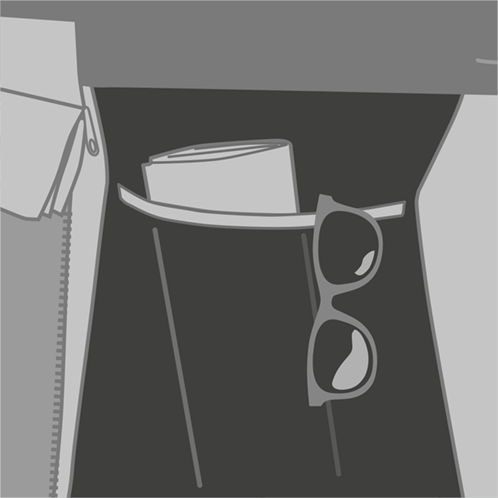 Temperature: The fabric is guaranteed for use in extremes of temperature, ranging from -30° C up to 70°C. 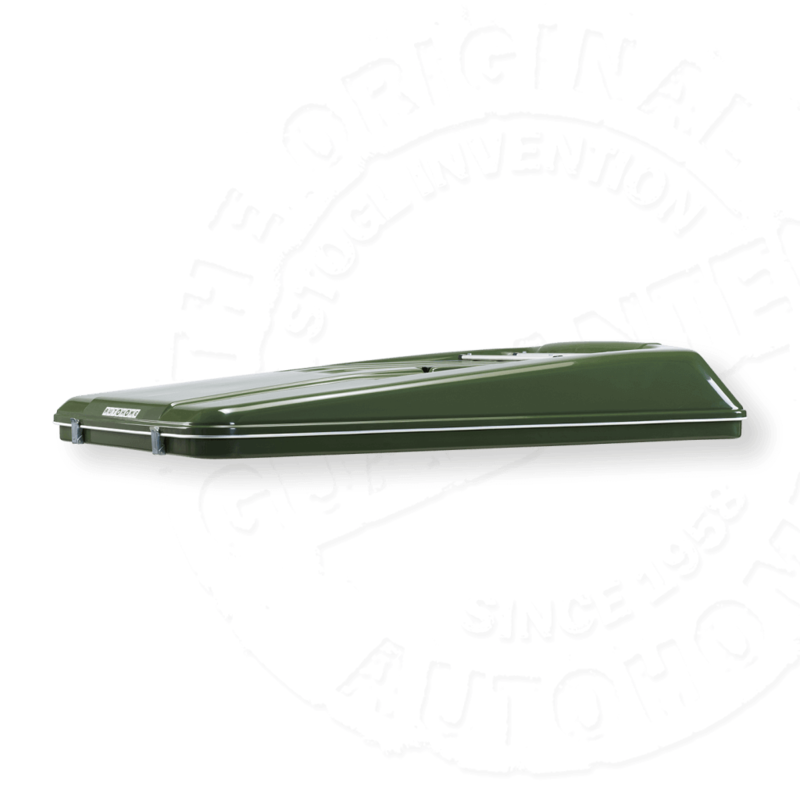 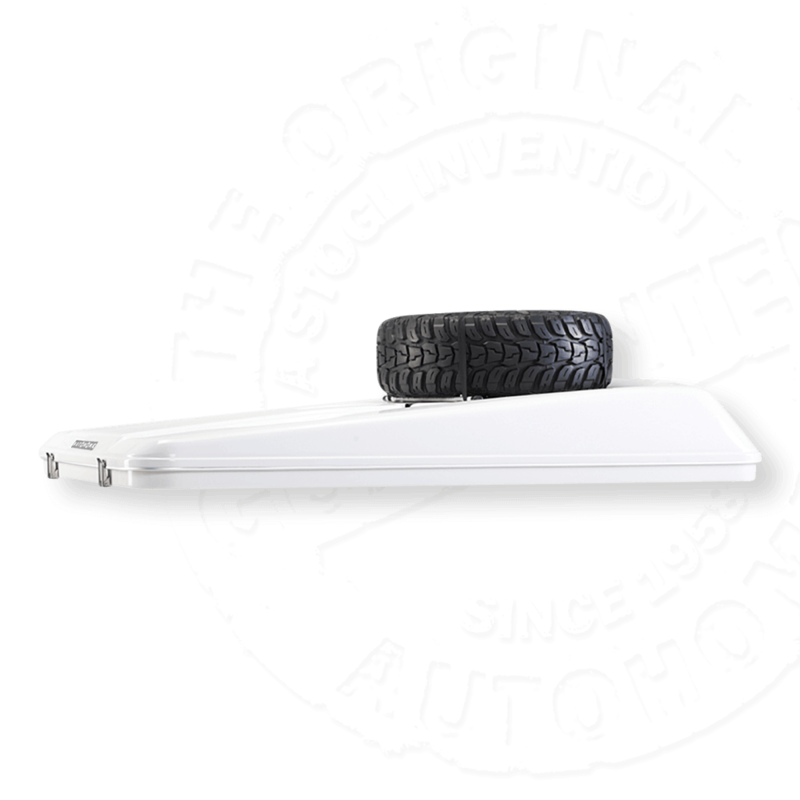 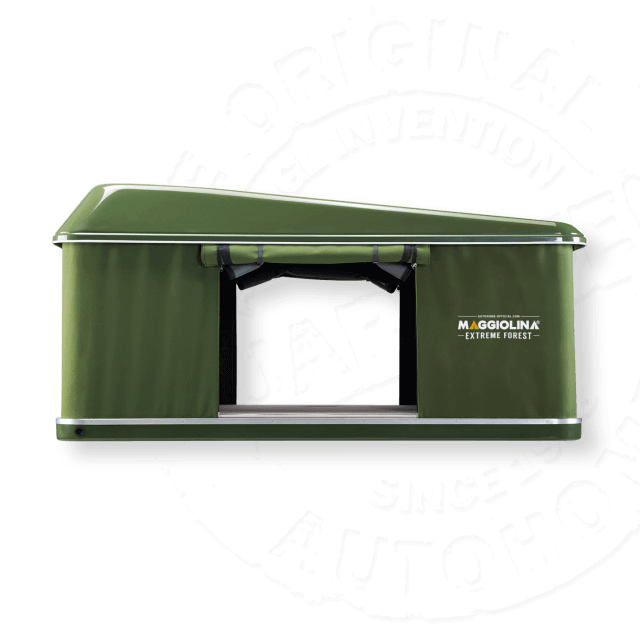 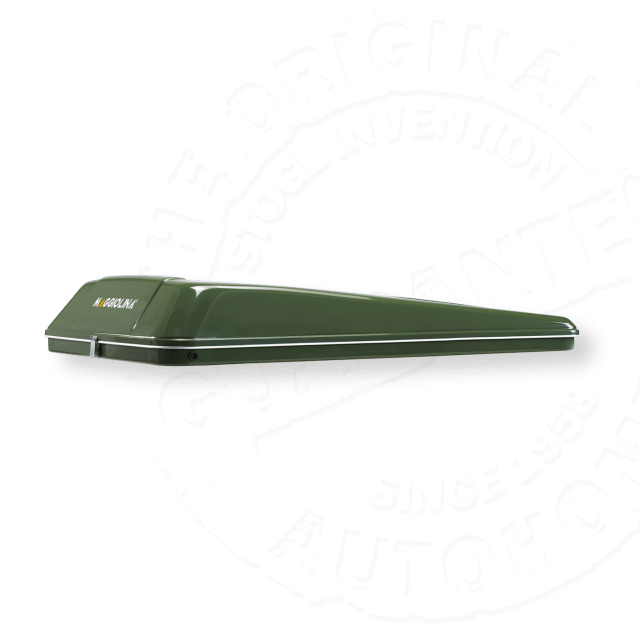 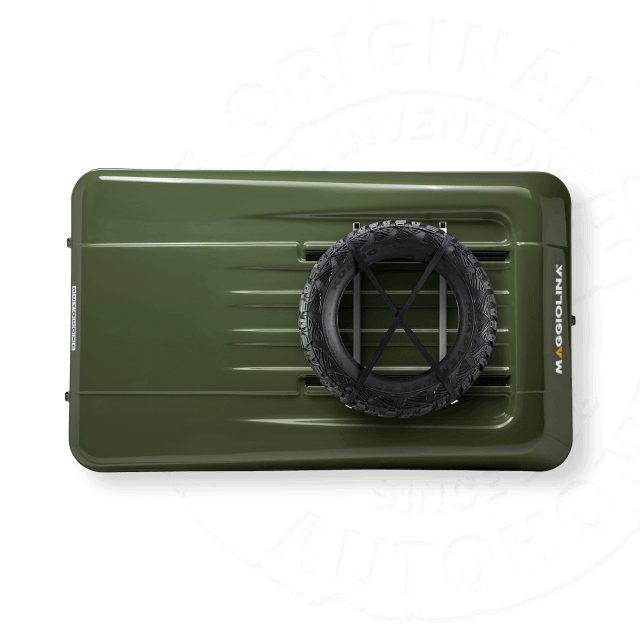 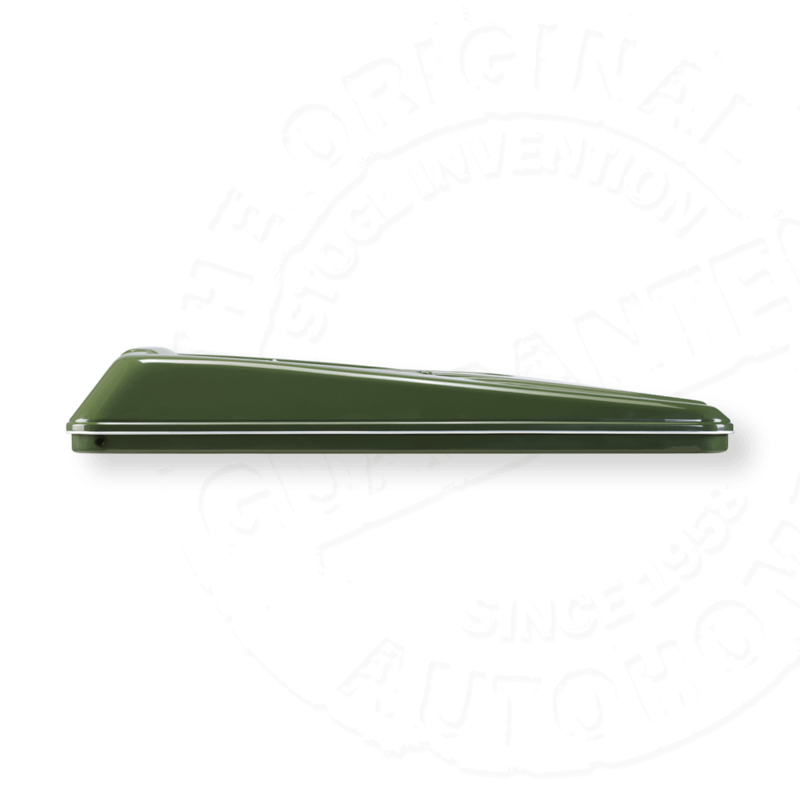 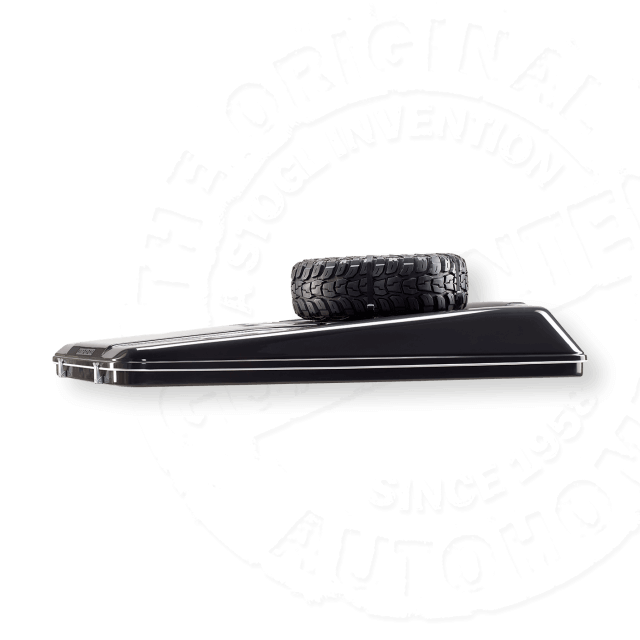 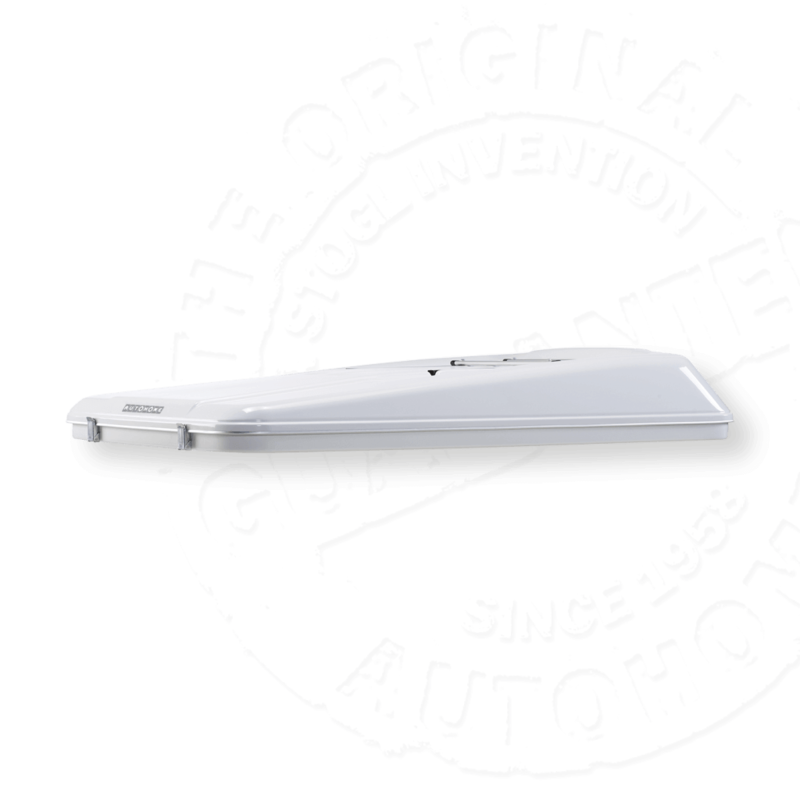 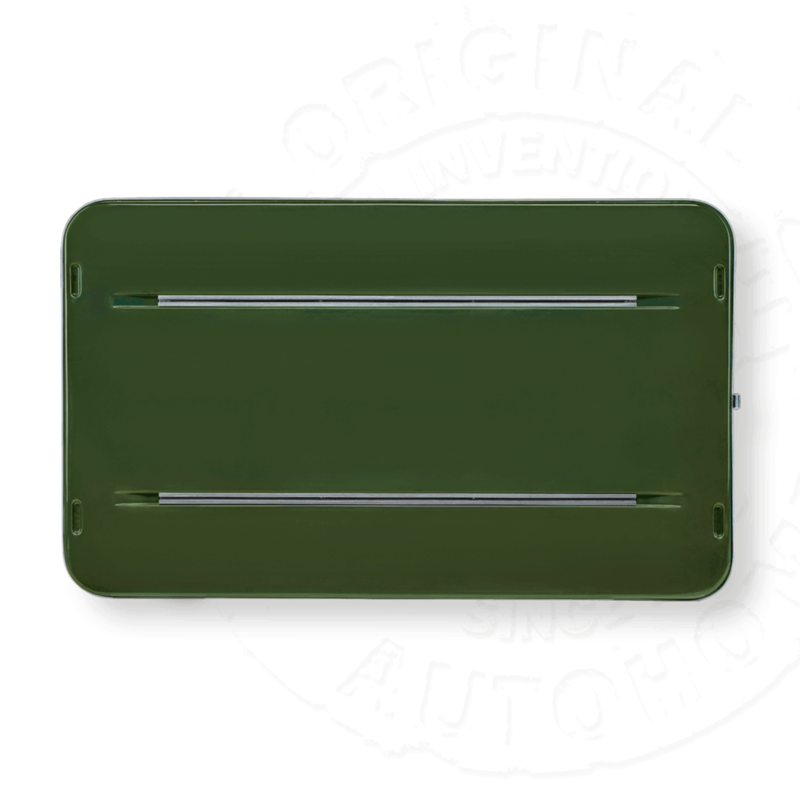 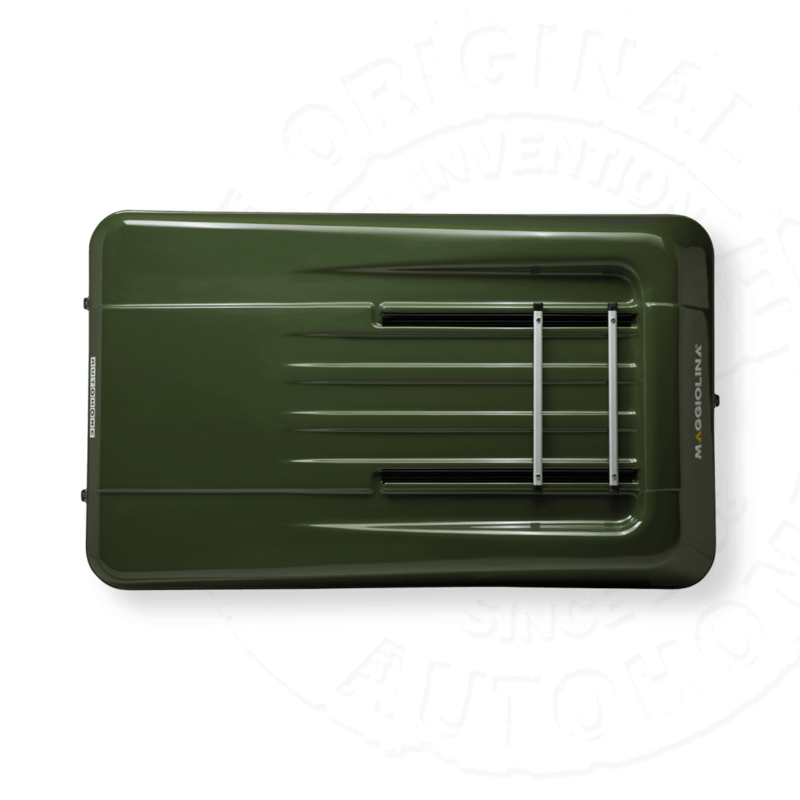 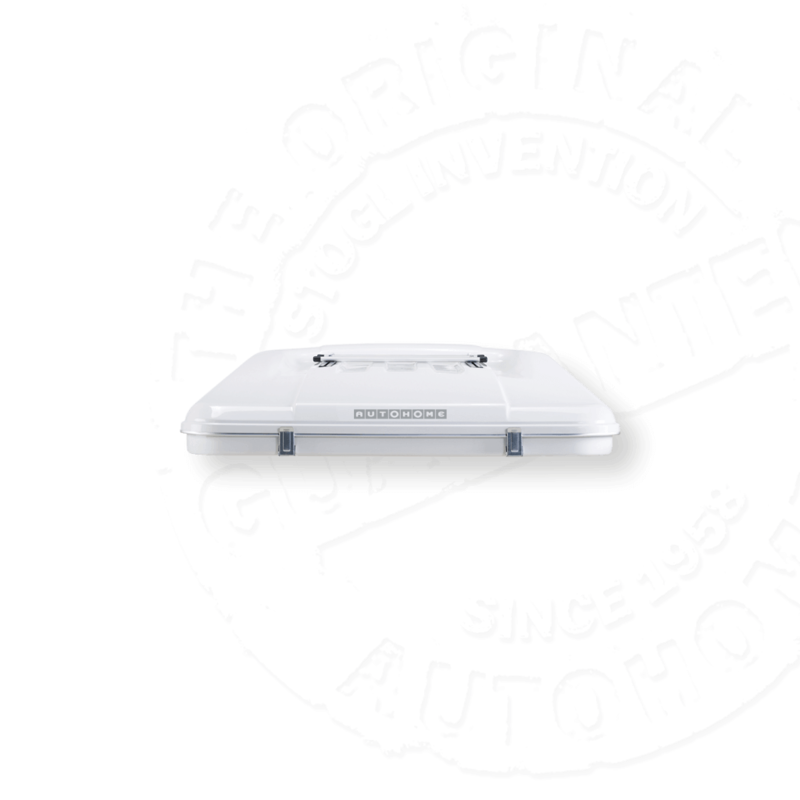 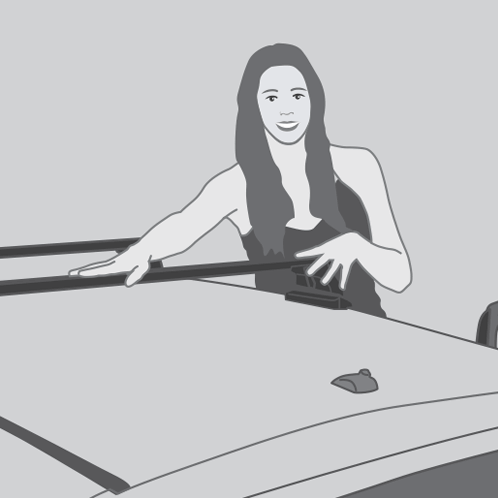 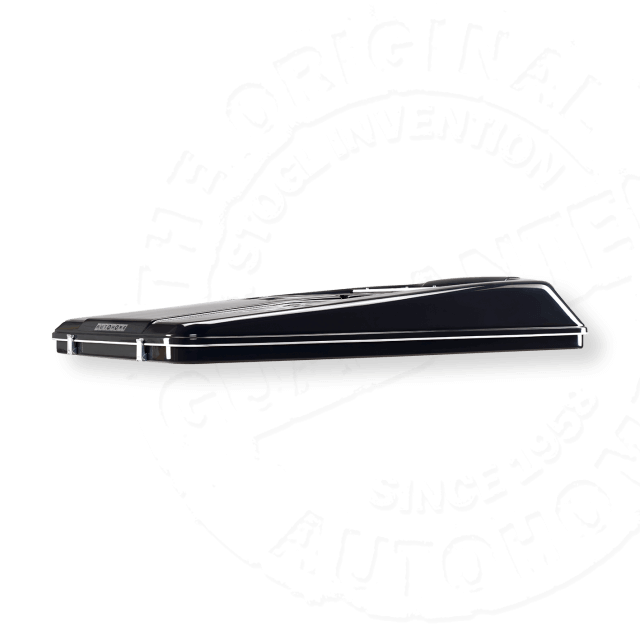 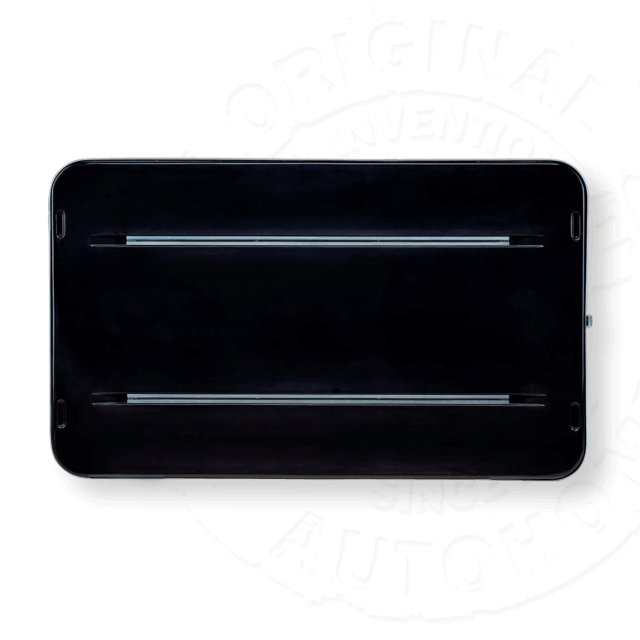 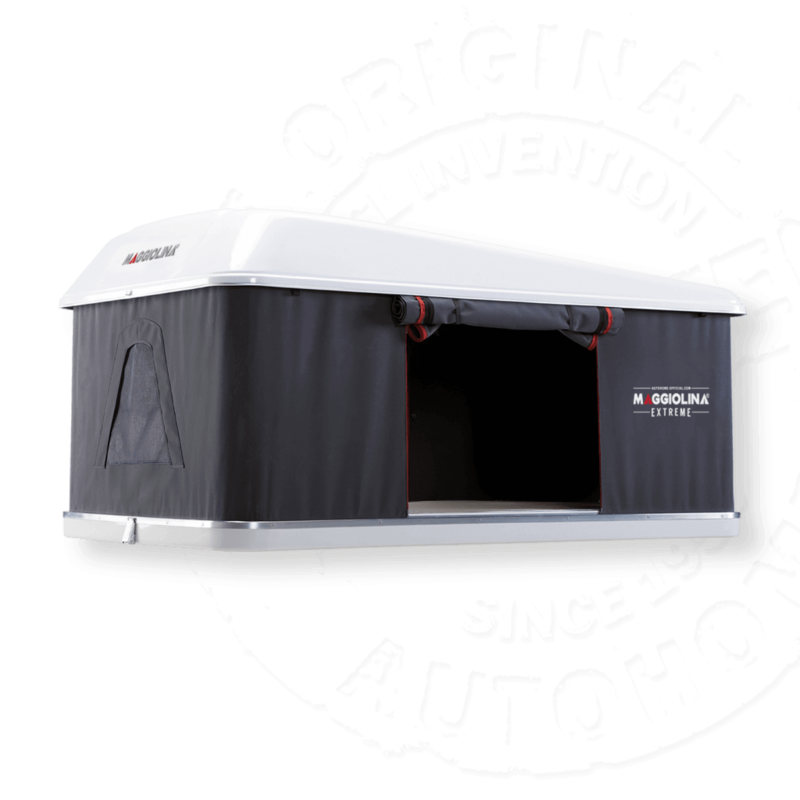 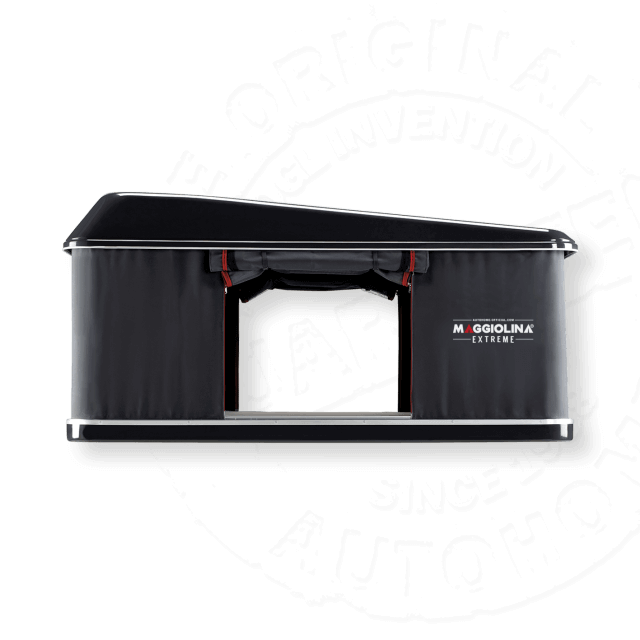 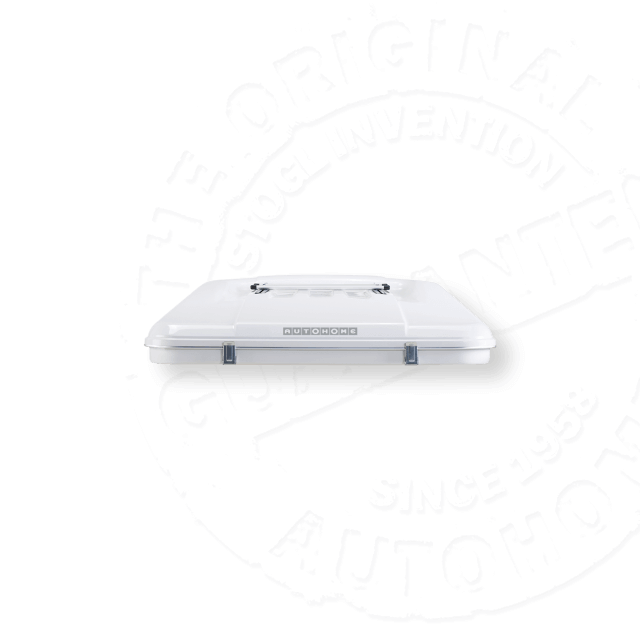 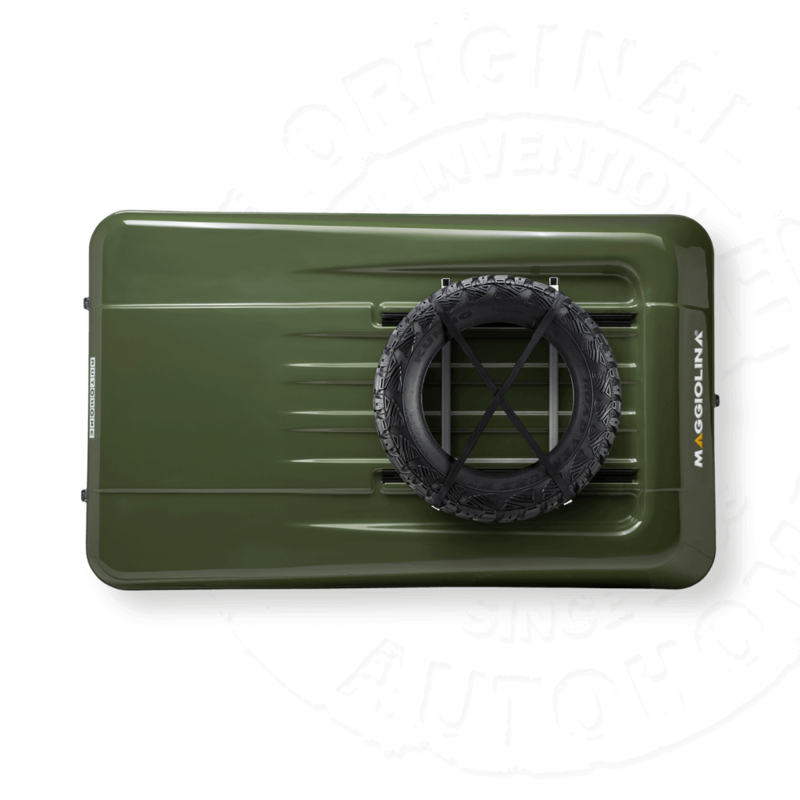 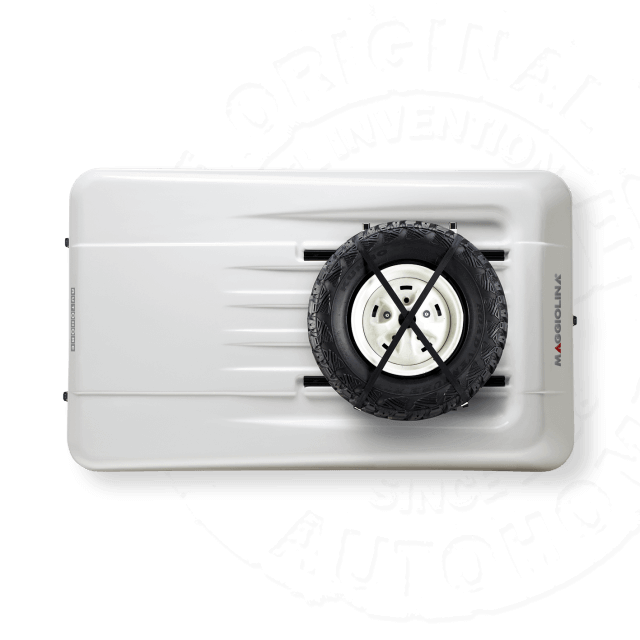 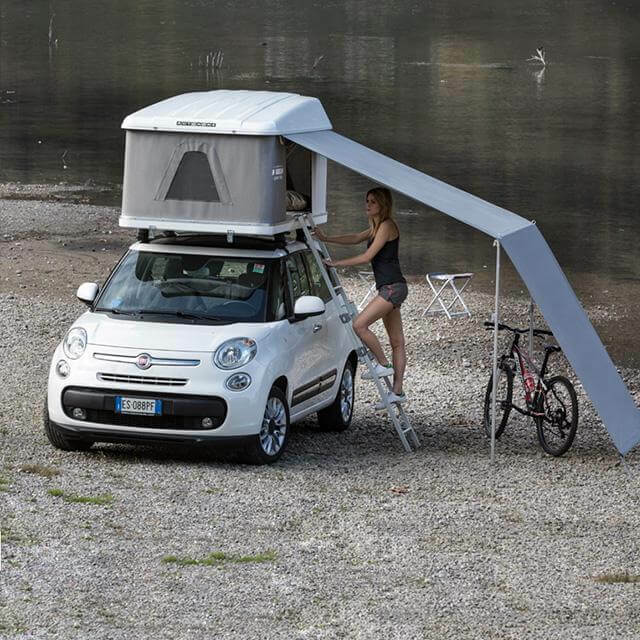 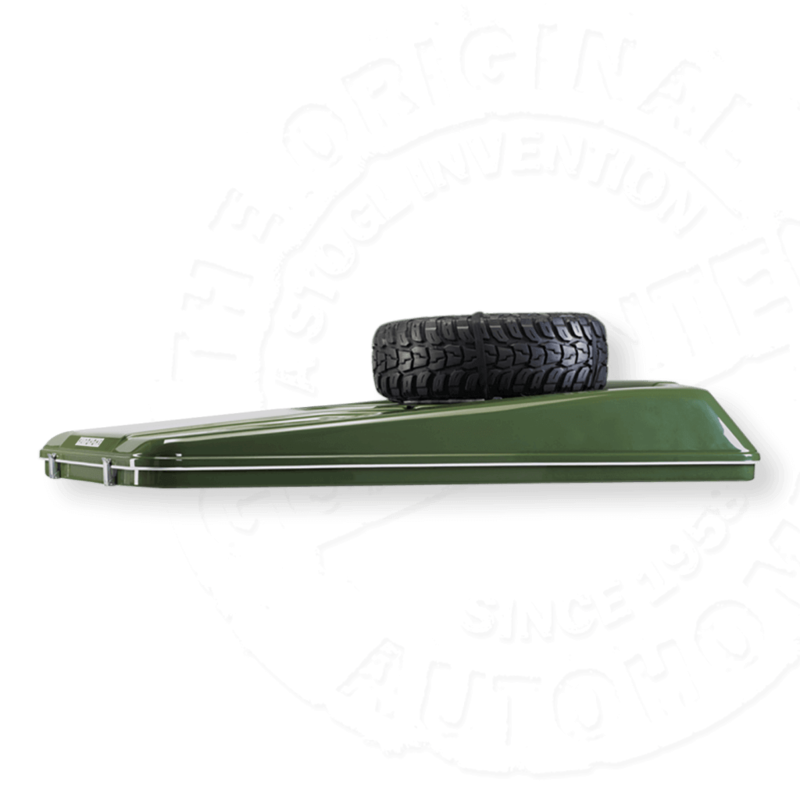 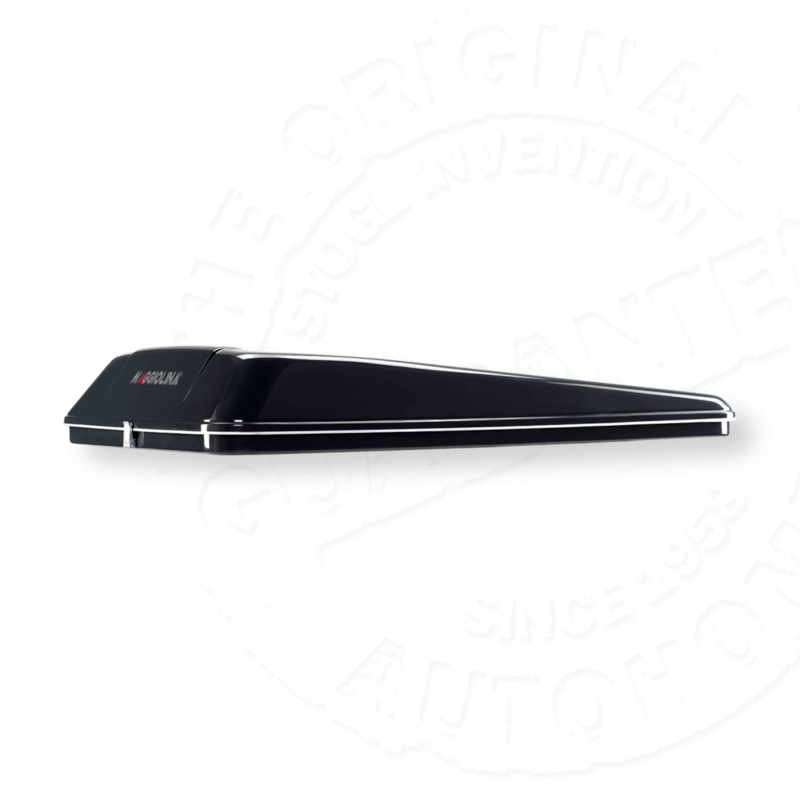 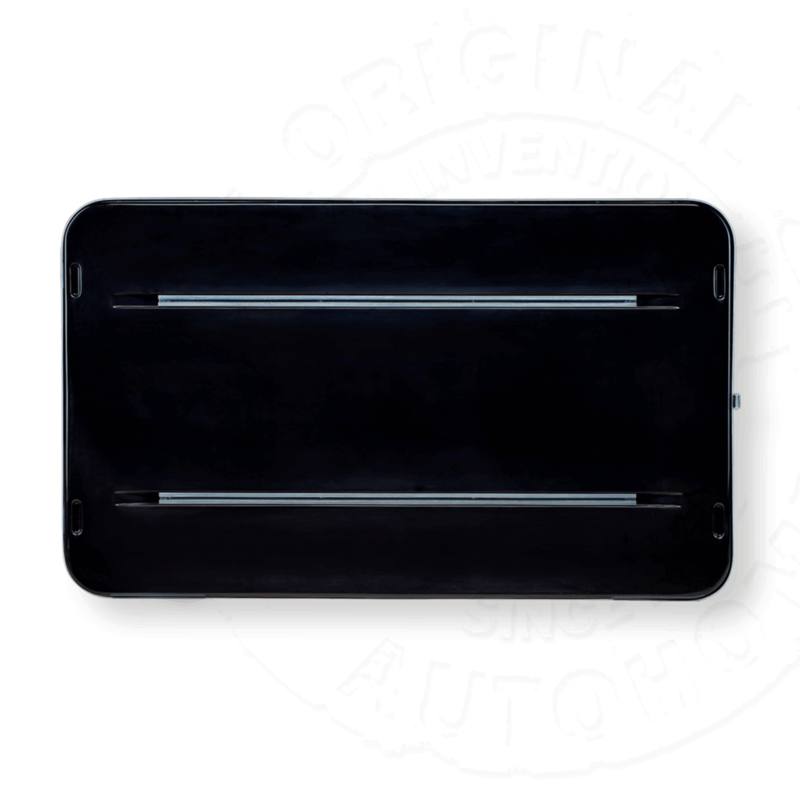 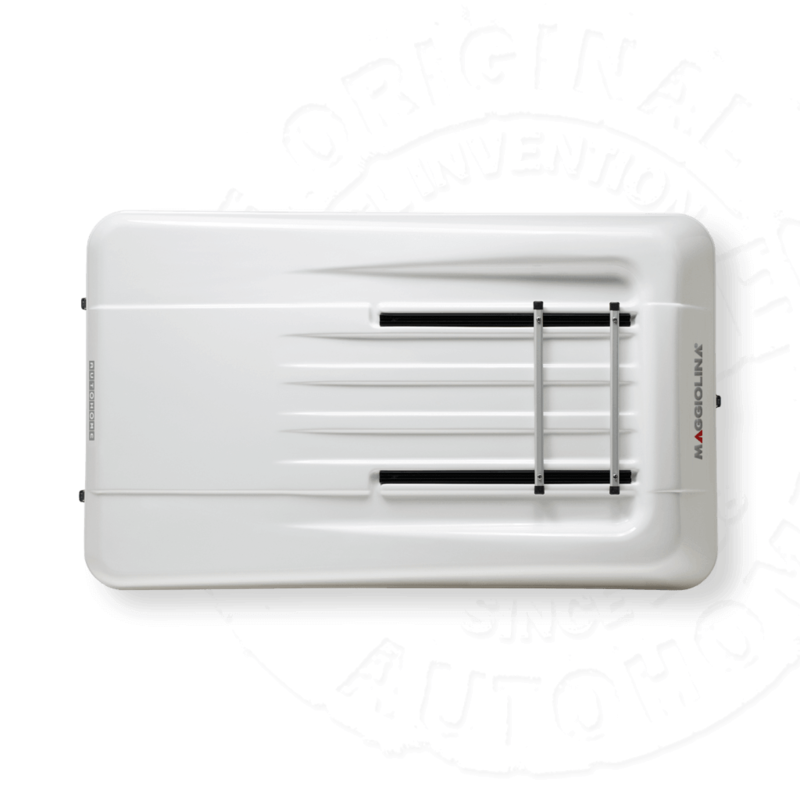 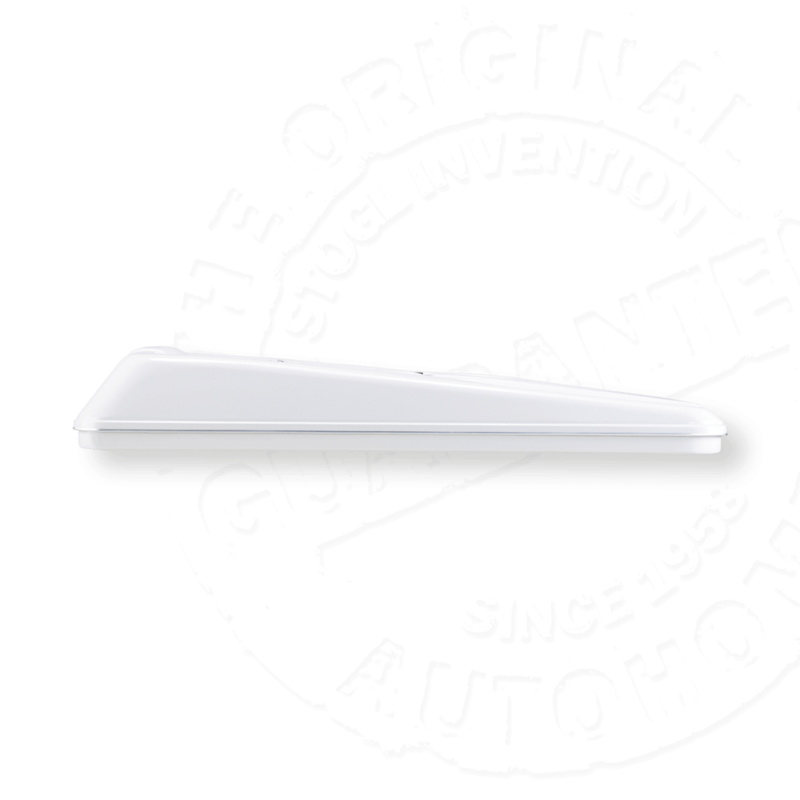 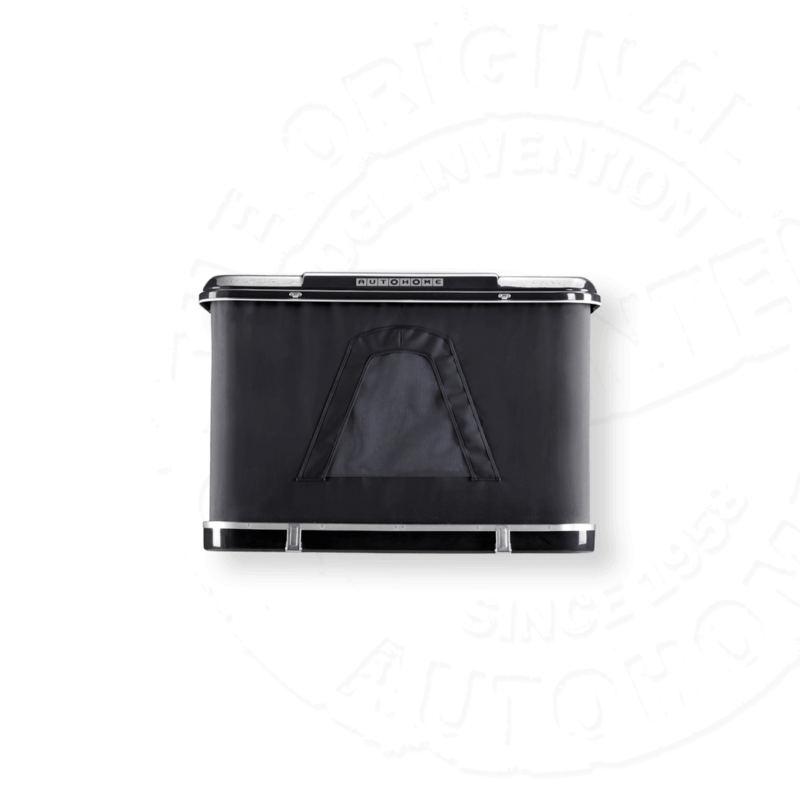 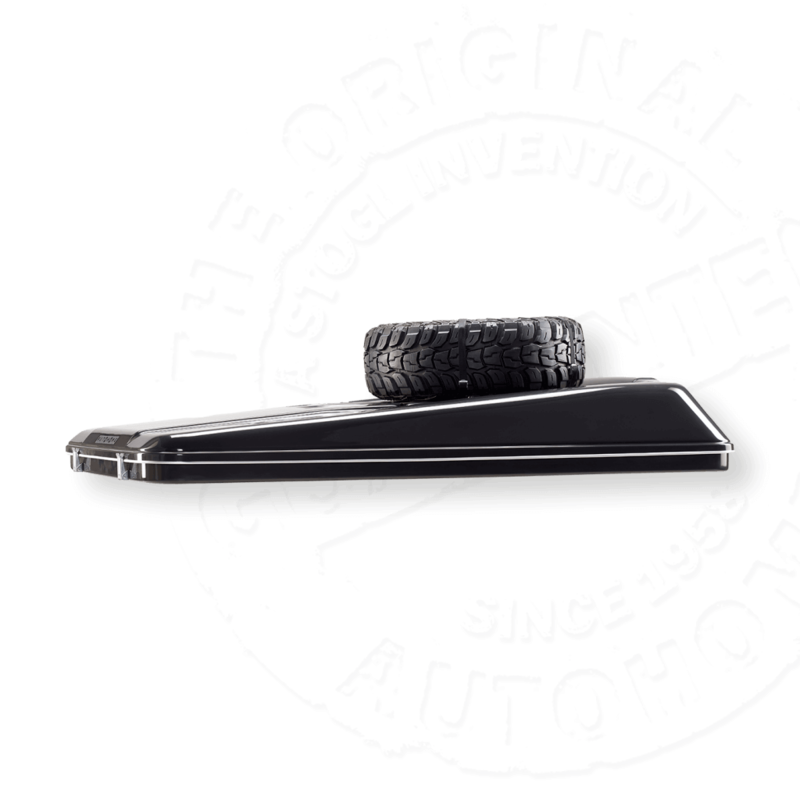 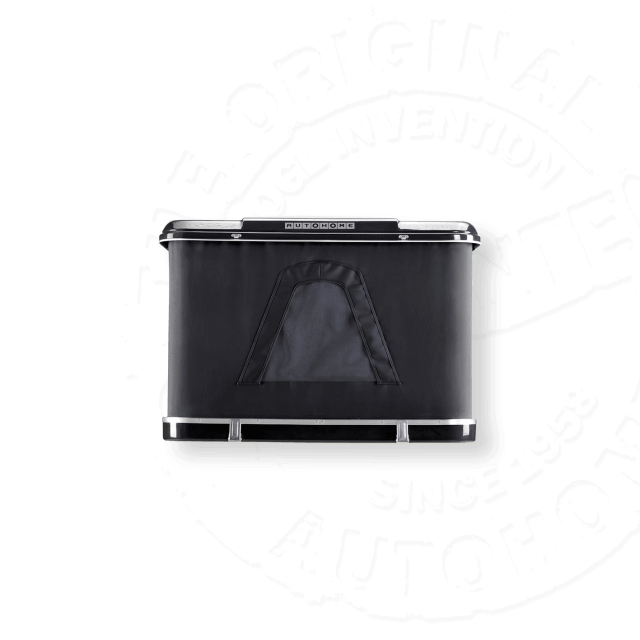 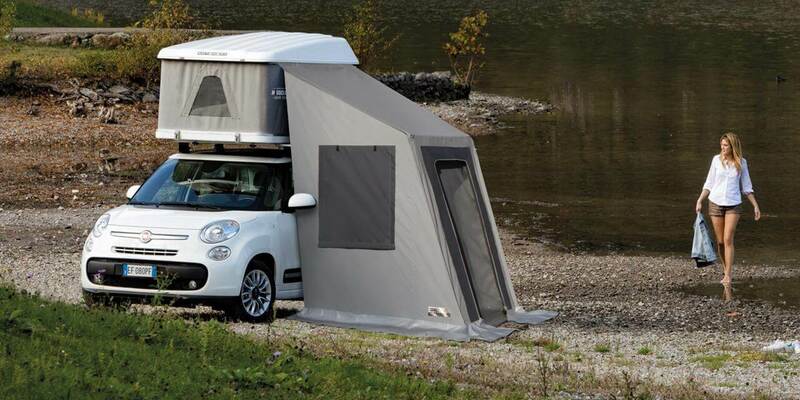 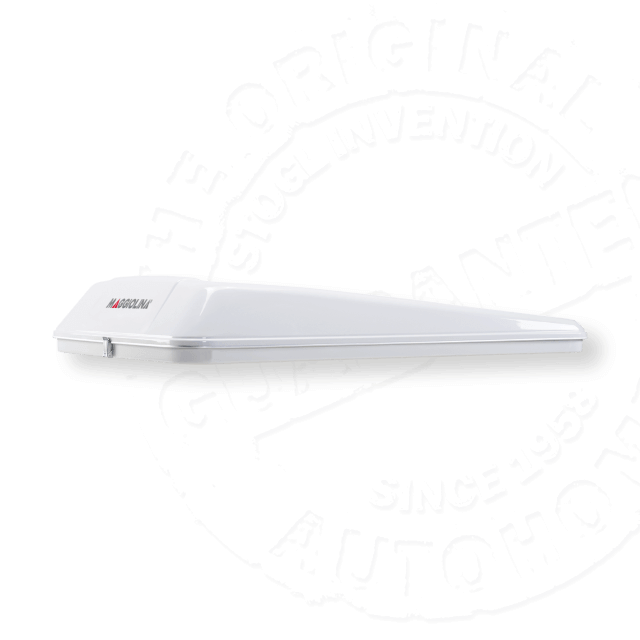 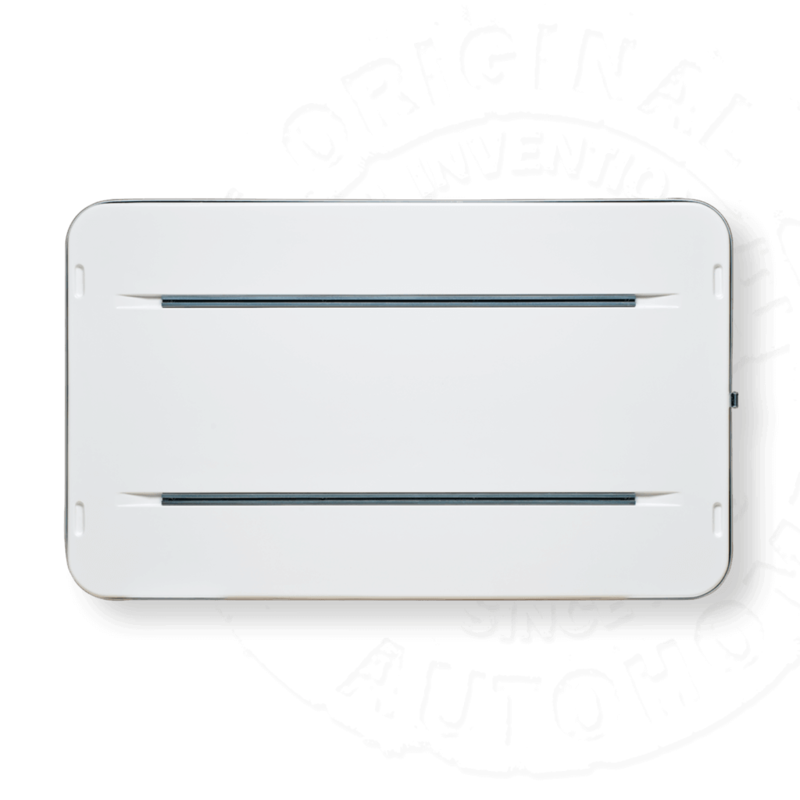 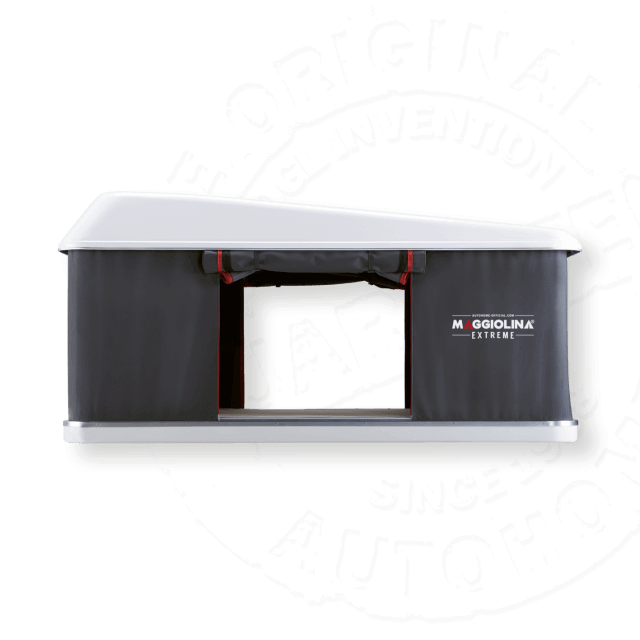 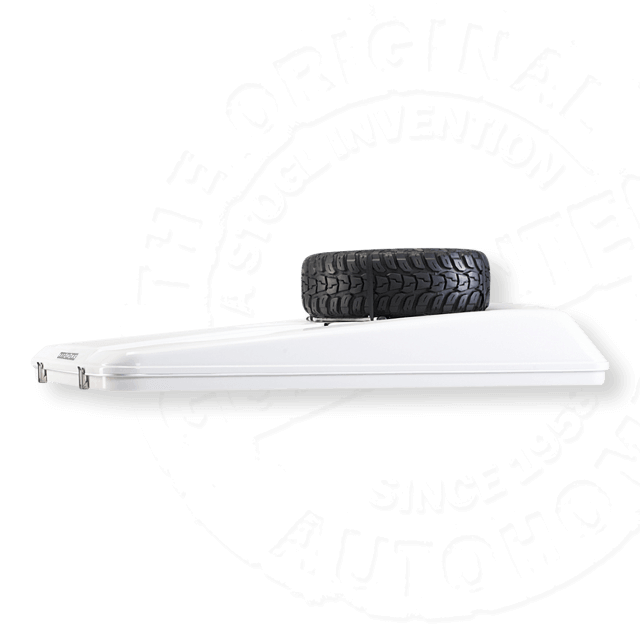 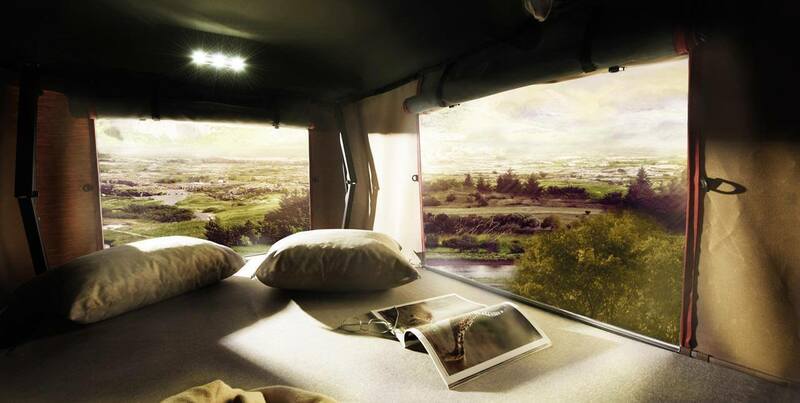 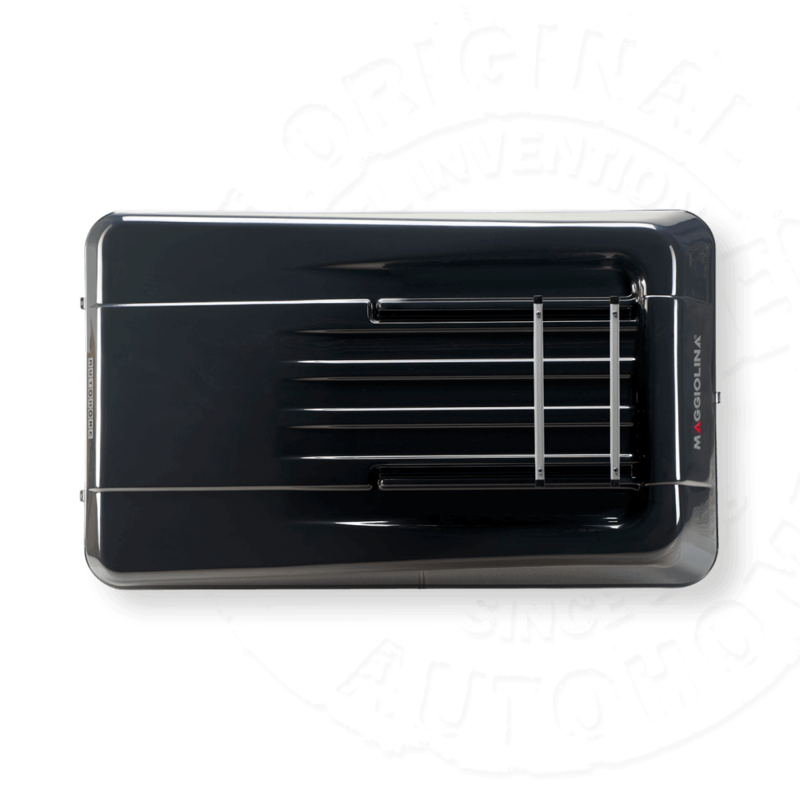 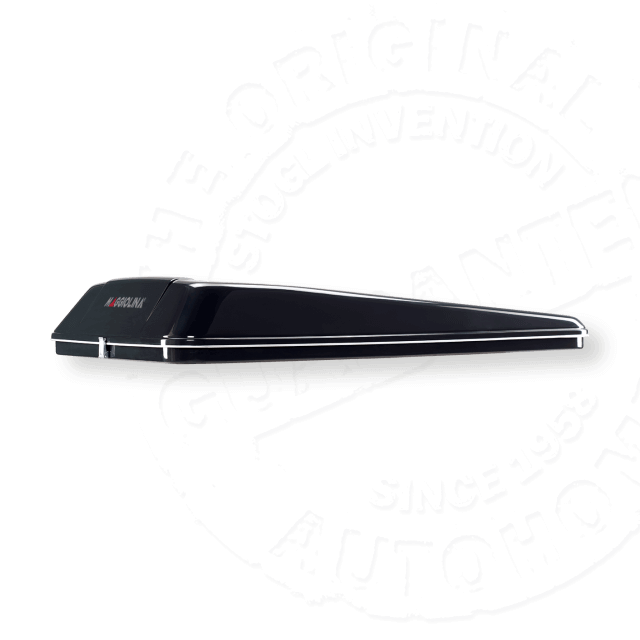 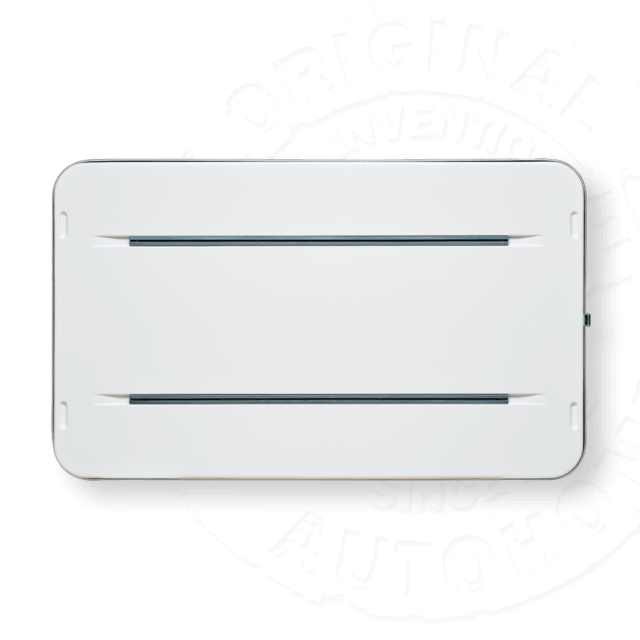 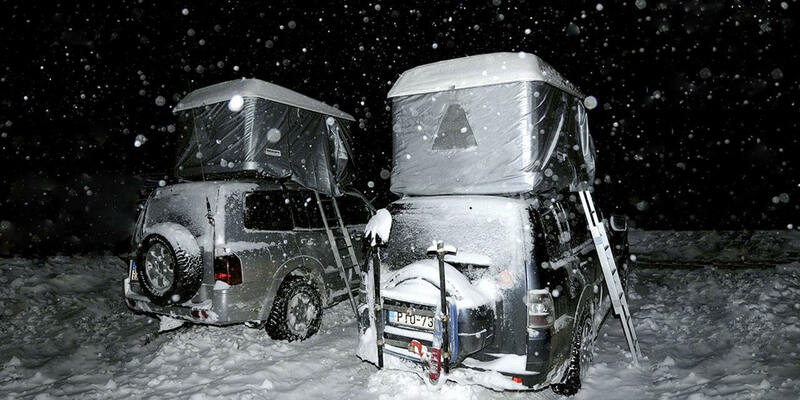 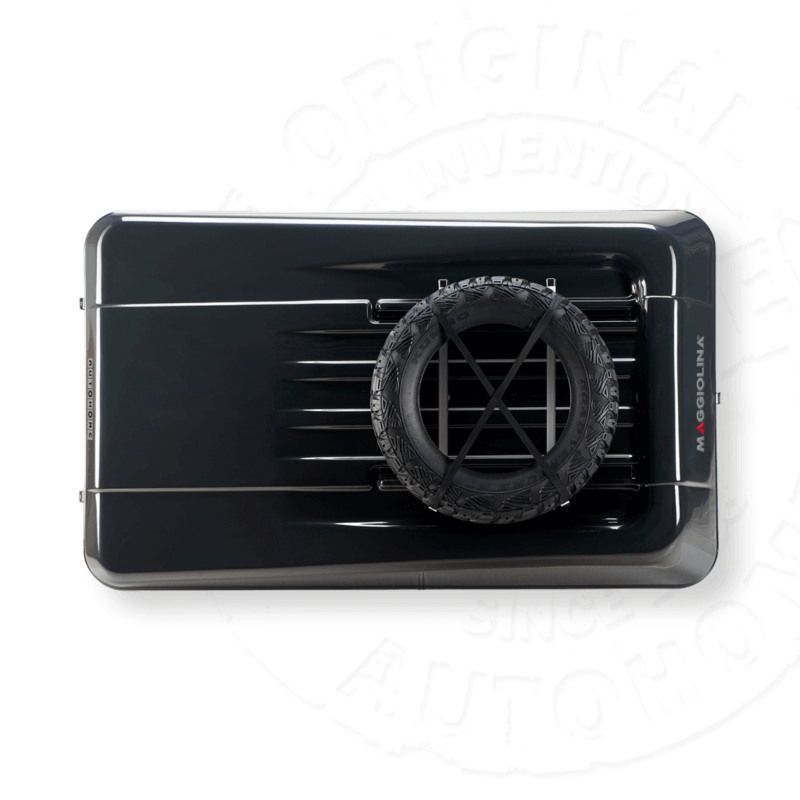 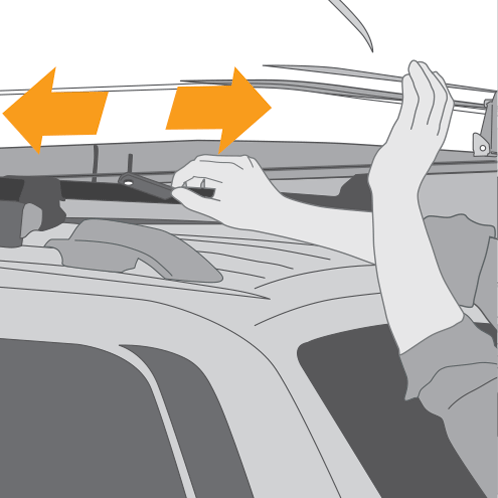 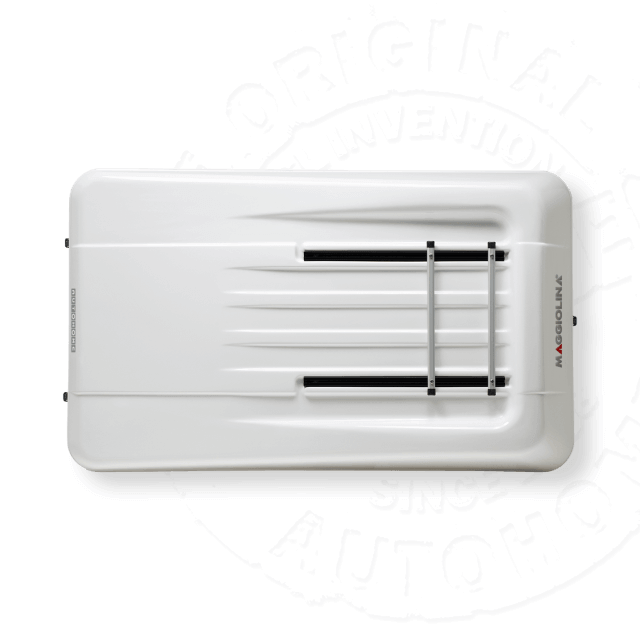 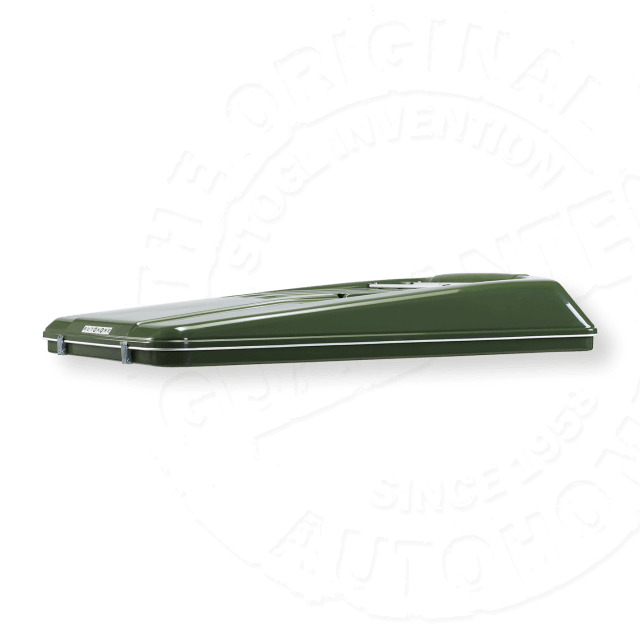 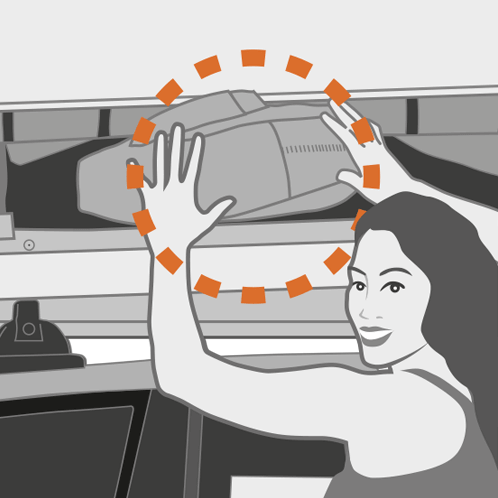 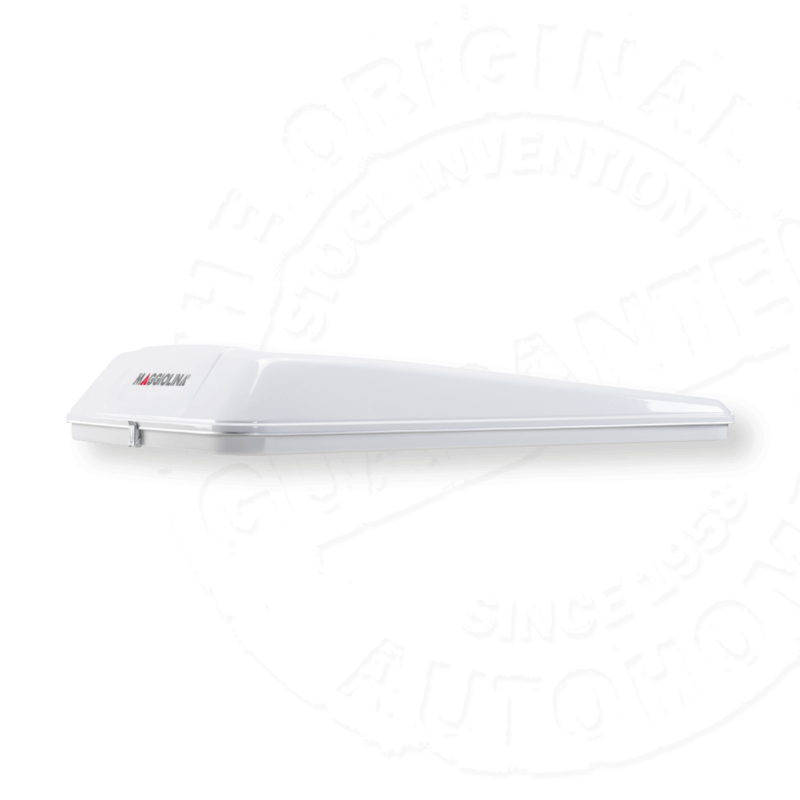 As for most of the versions of Autohome roof tents, the shells are made of fiberglass. 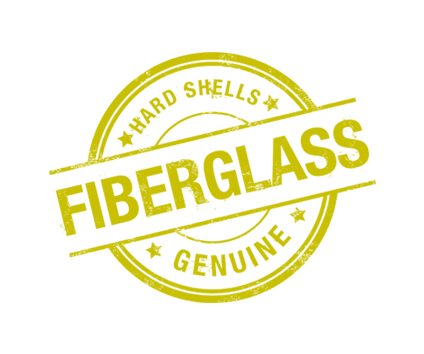 Fiberglass is a particular fabric fiber interweaved and soaked in resinous liquid substances or polyester. 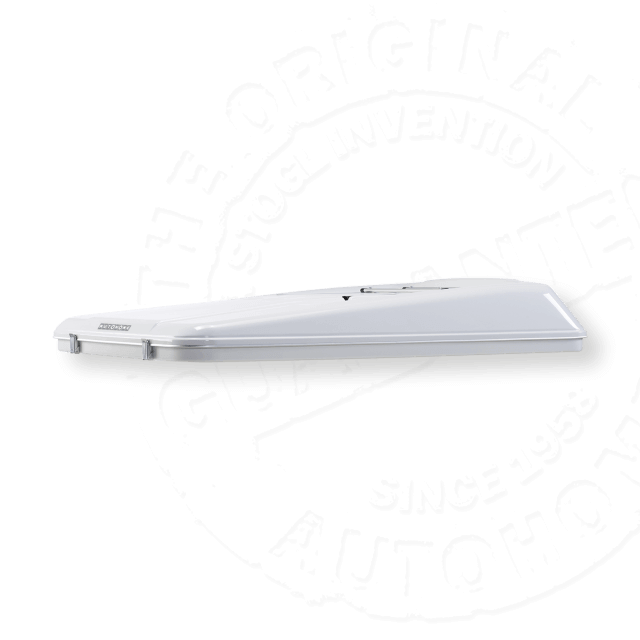 This material is also known as GRP, glass reinforced plastic (GFK in German). 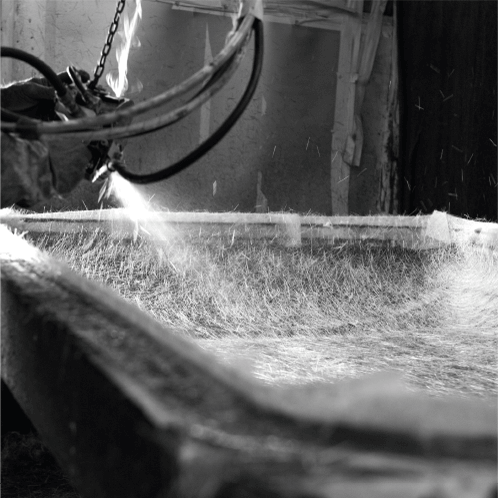 Fiberglass is very widespread within the building industry and used especially for roofs and other industrial and urban coverings. 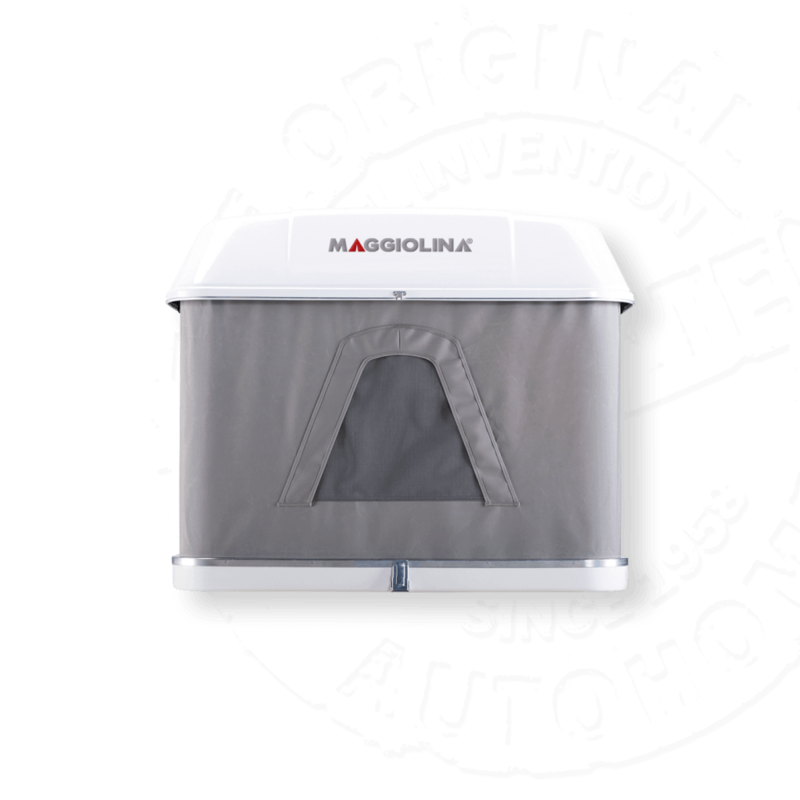 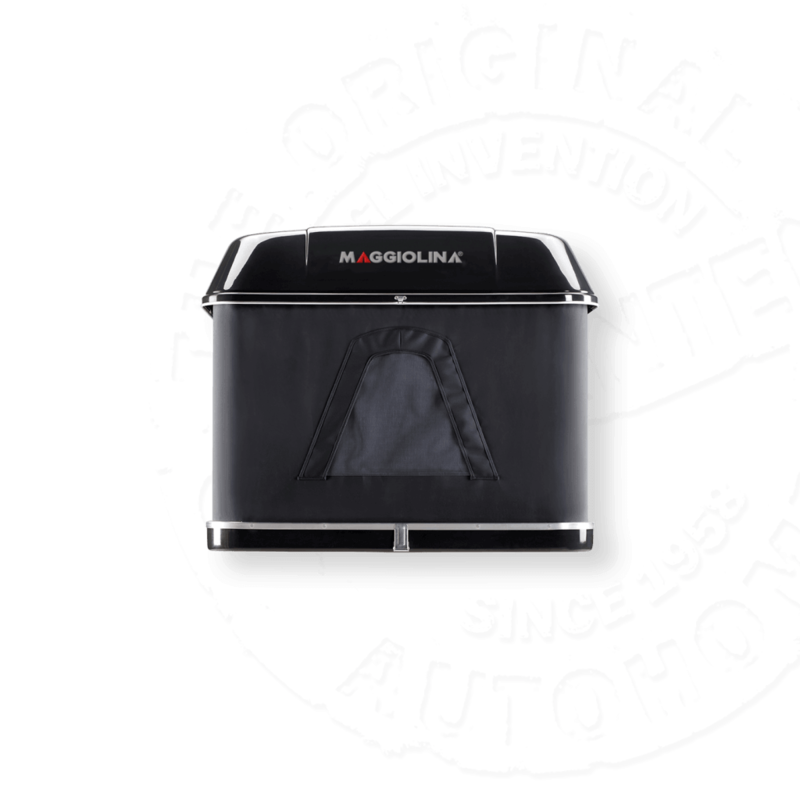 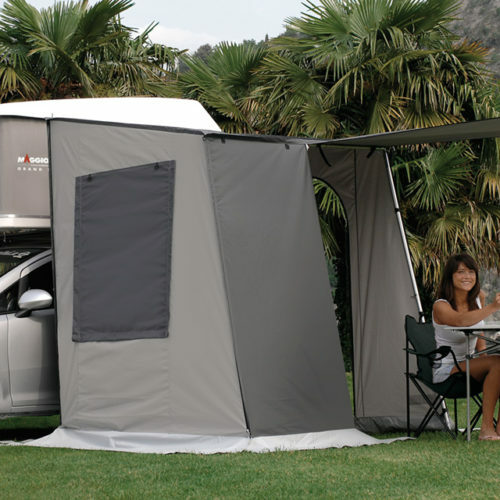 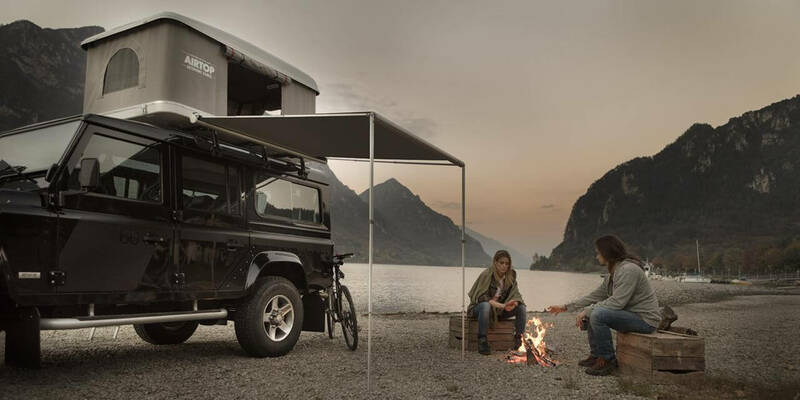 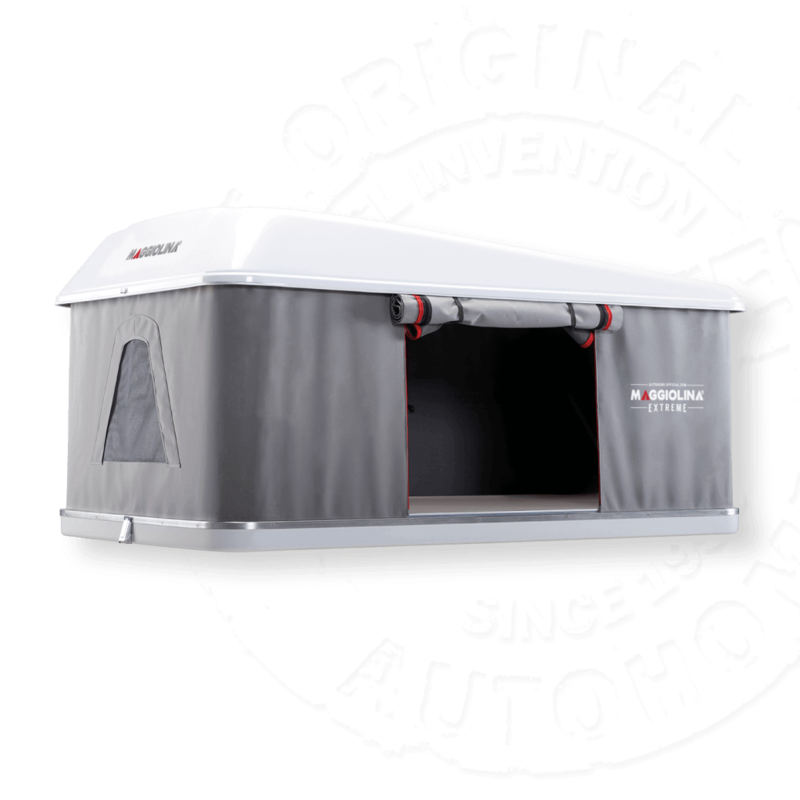 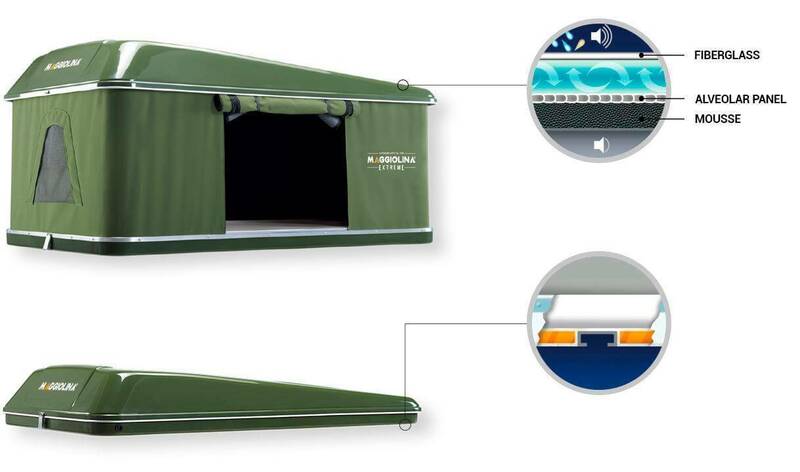 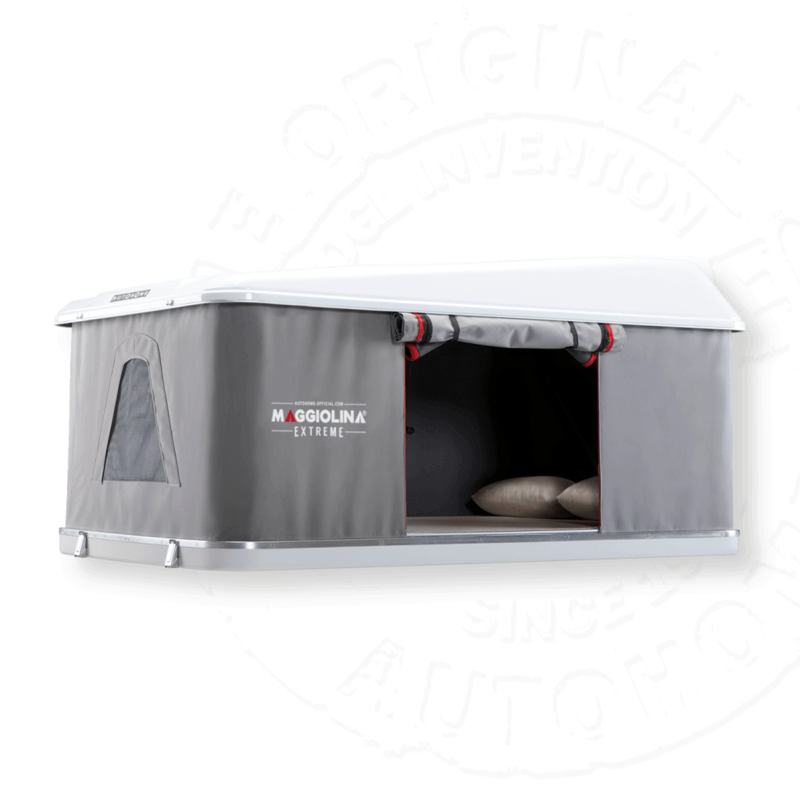 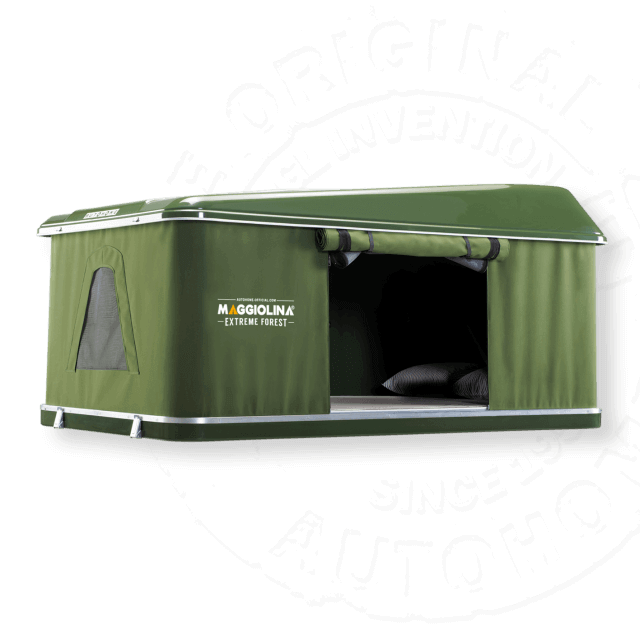 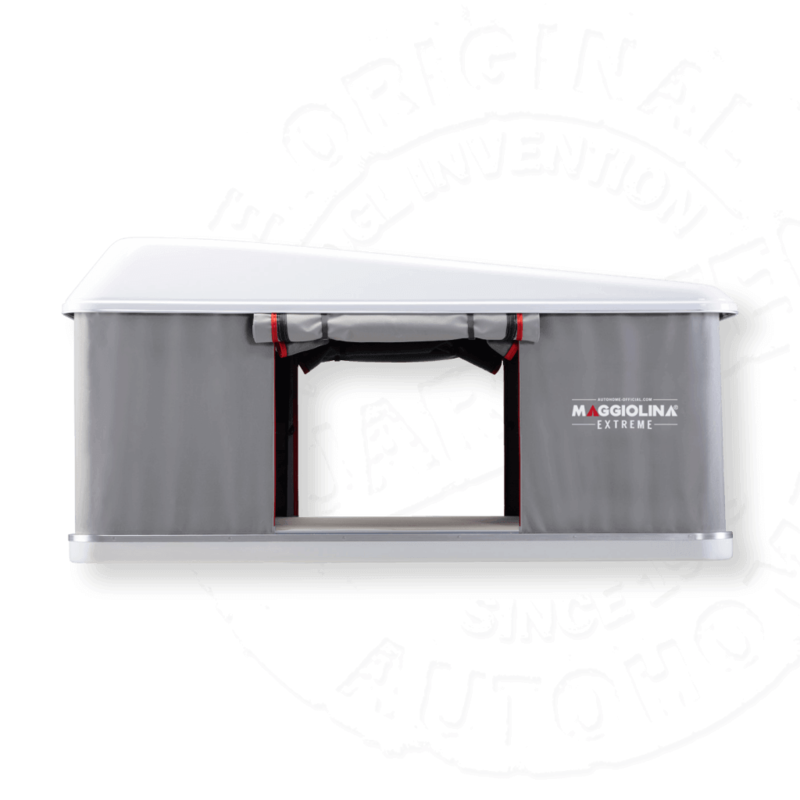 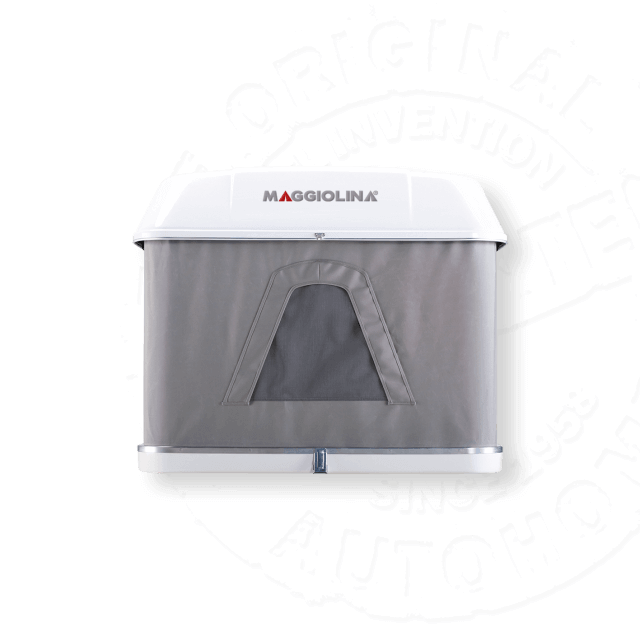 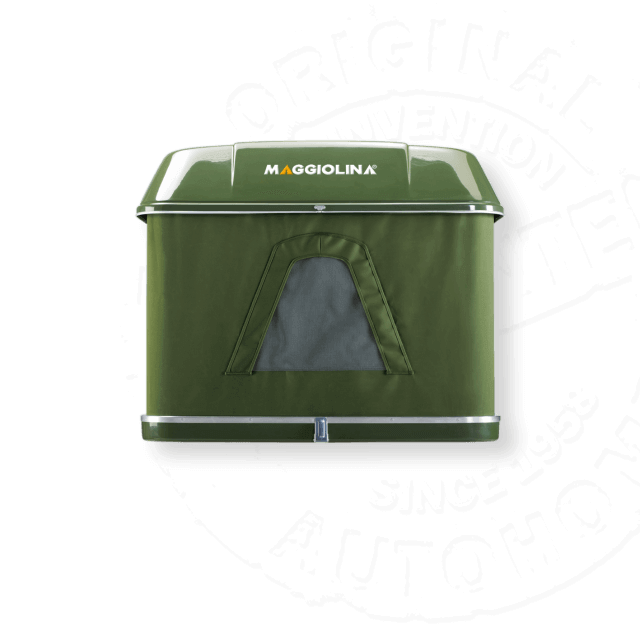 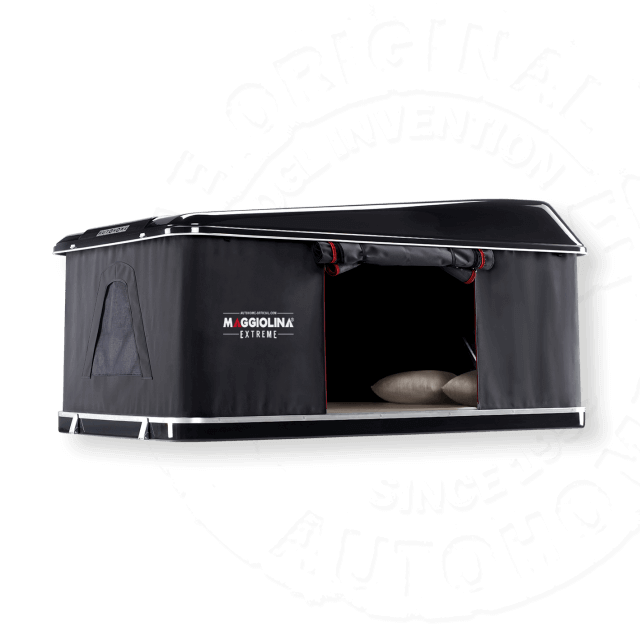 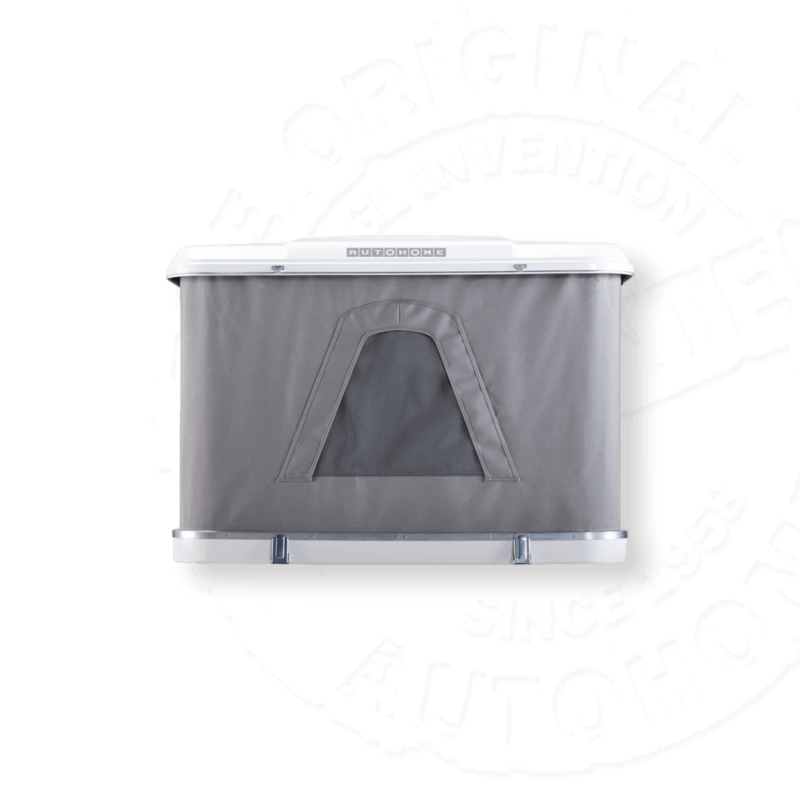 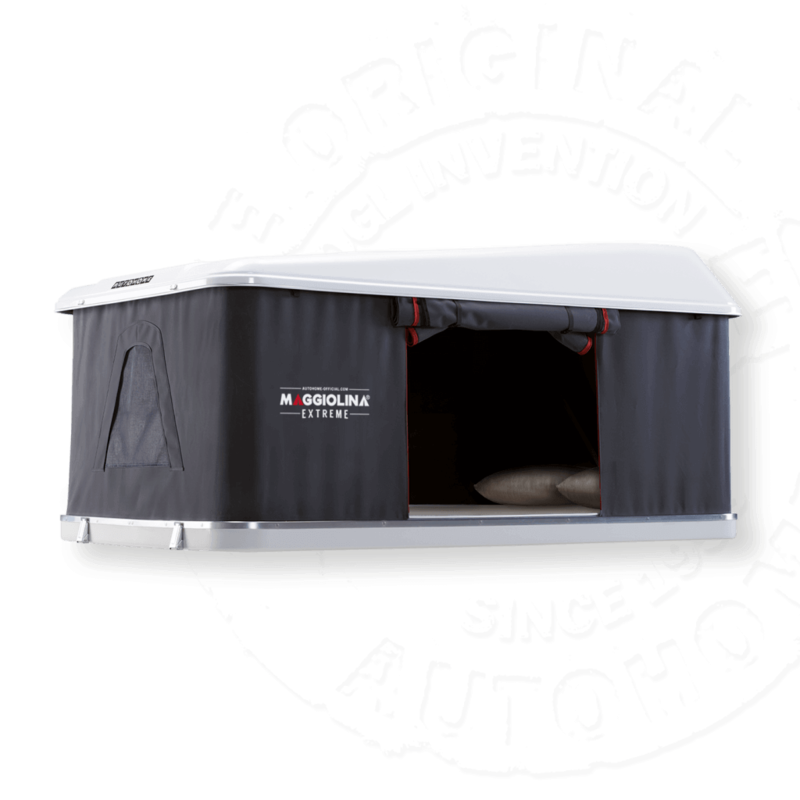 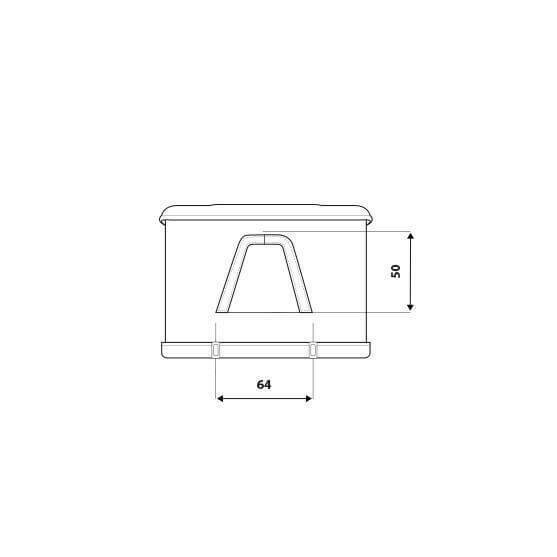 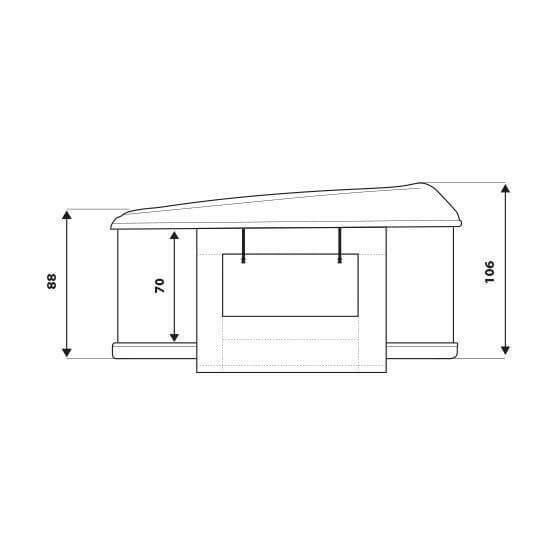 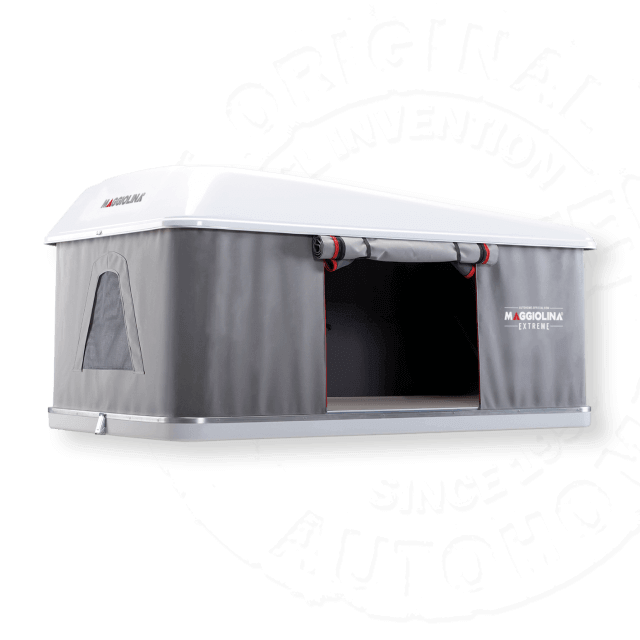 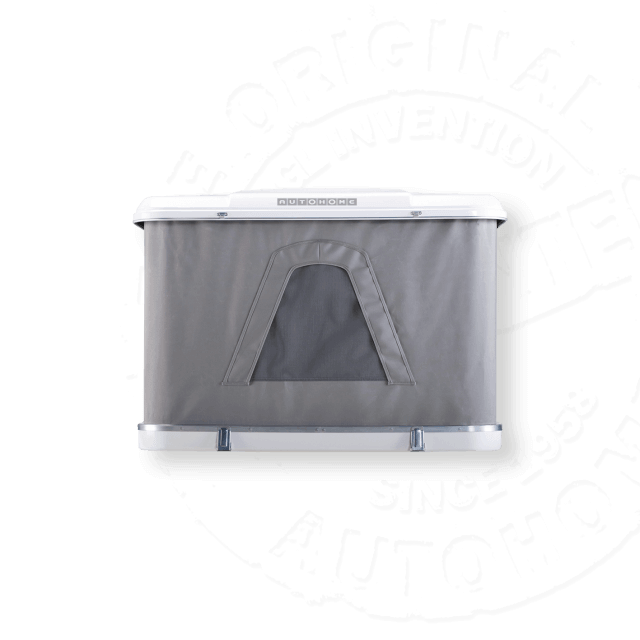 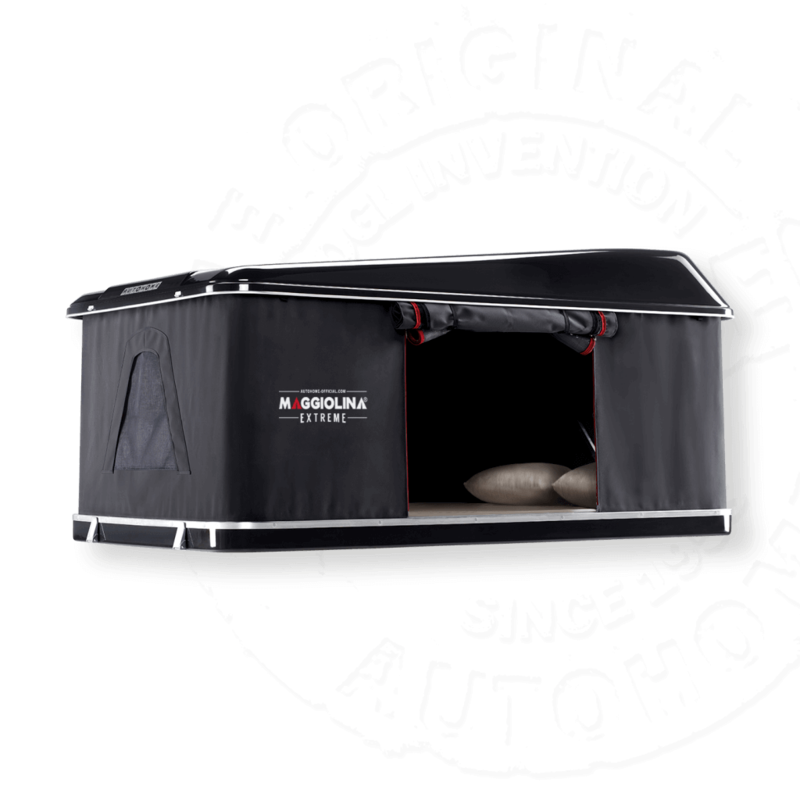 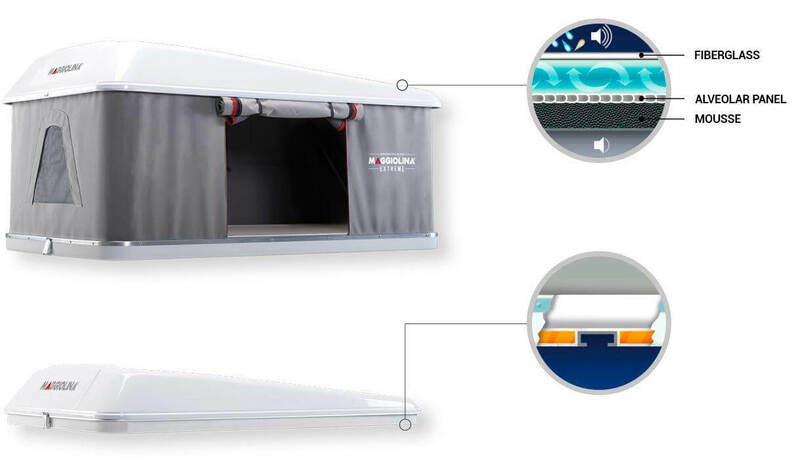 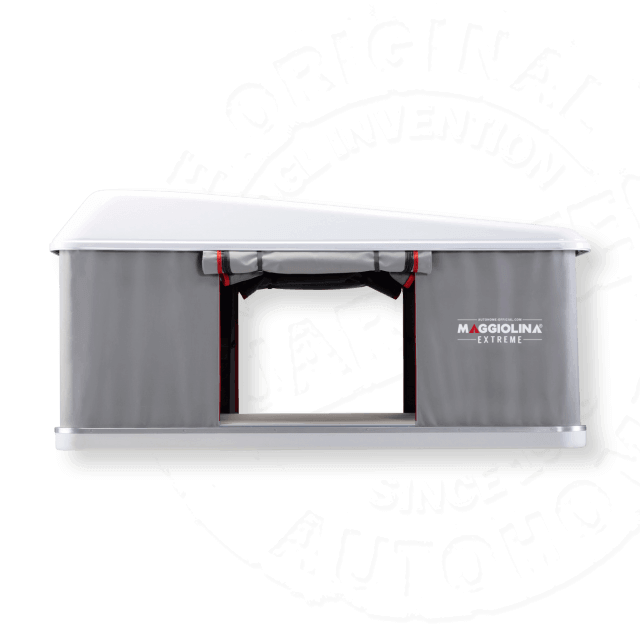 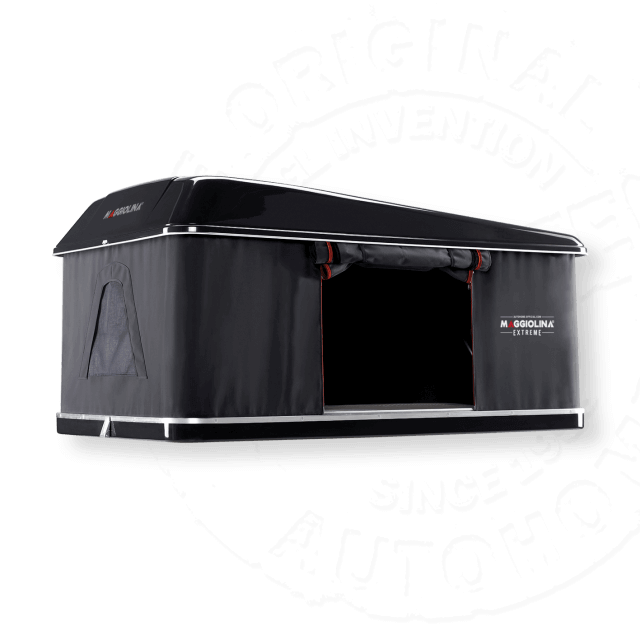 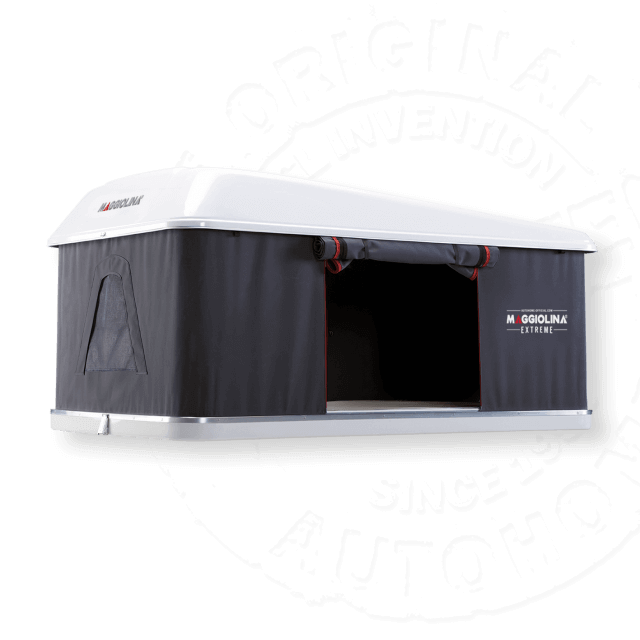 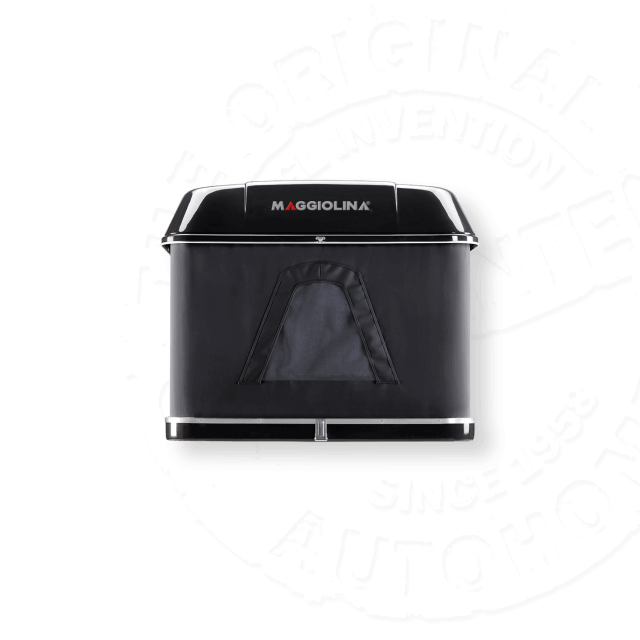 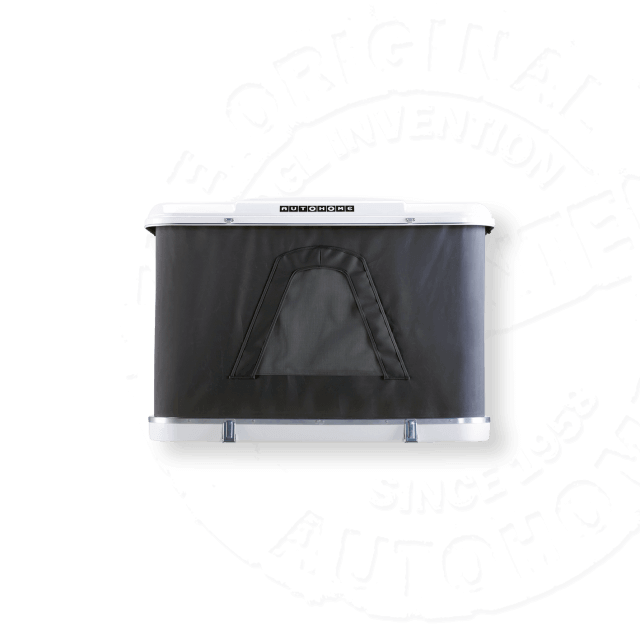 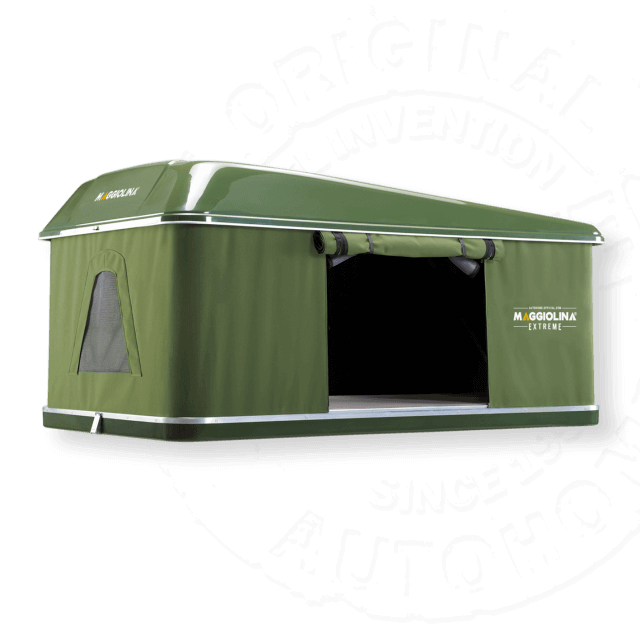 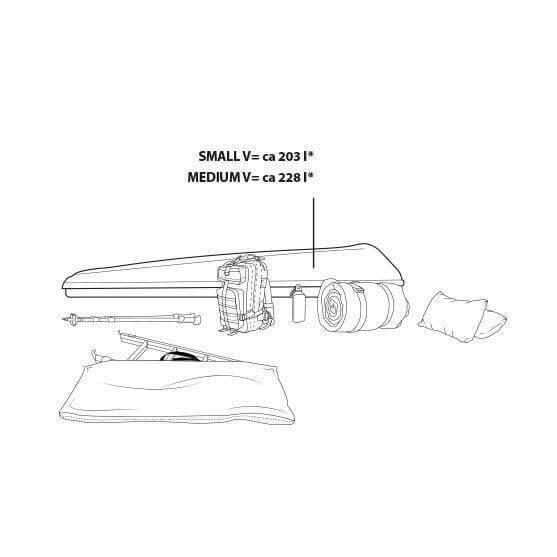 It does not get warm under the sun and keeps any closed environment insulated from heat and cold, an indispensable feature for any roof tent. 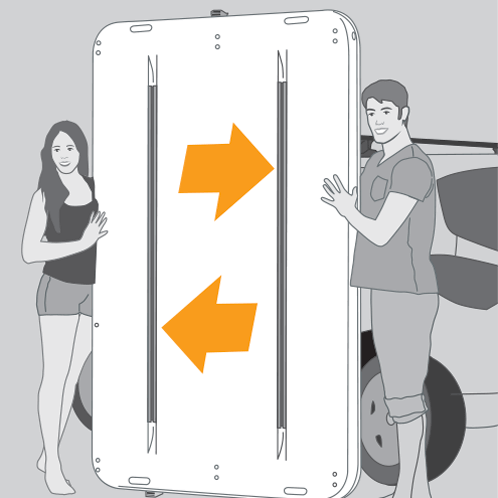 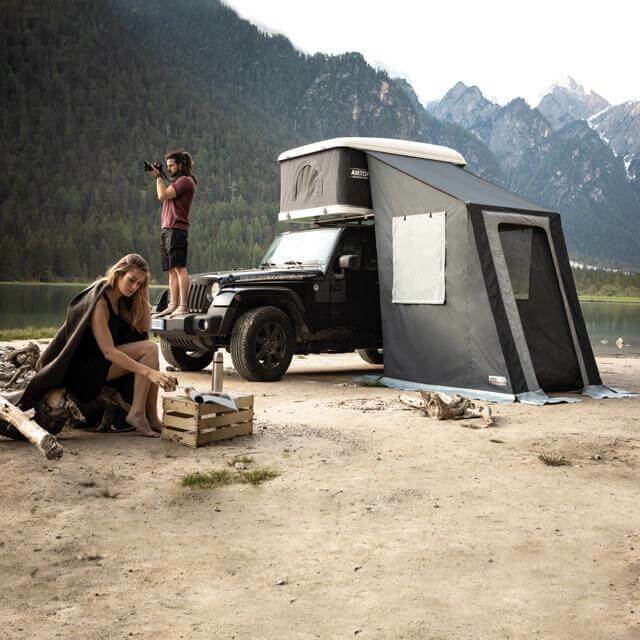 Thanks to fiberglass, Autohome’s shells guarantee excellent quality not only in regard to their endurance and sound proof insulation, but also in terms of lightness and easiness to repair (avoiding this way the high costs of substitution of entire shells) This is one of the secrets that give Autohome roof tents superior quality and reliability. 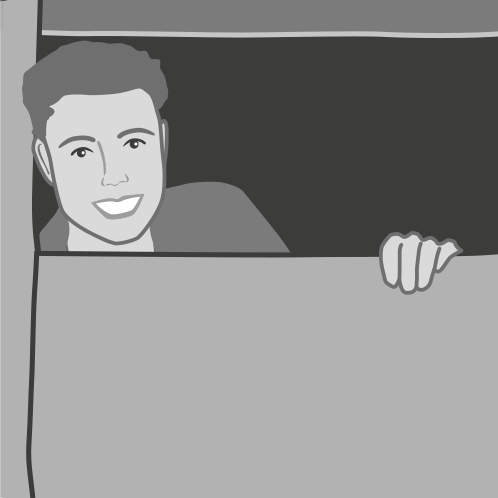 Wherever. 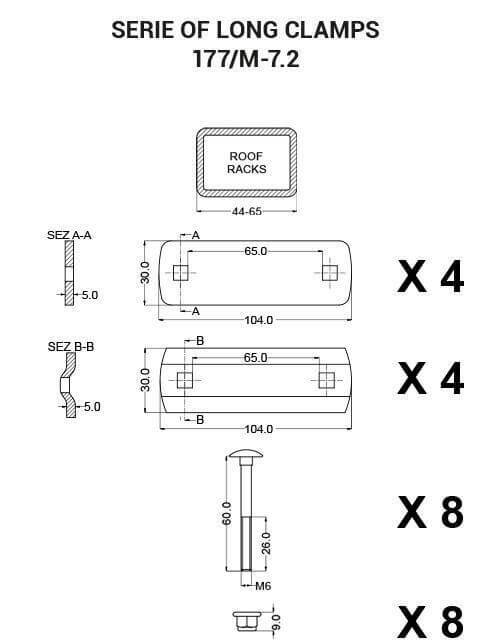 Whenever. 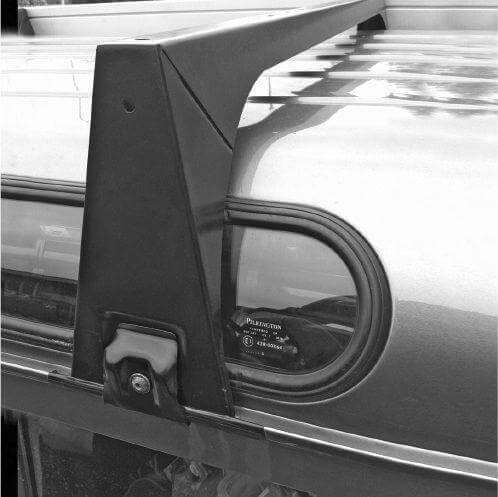 The quality of fiberglass is so great that this material is also used in the manufacturing of boats and cars, especially for bodyworks and hulls that need rigidity and stability throughout time… the best campers, for example, are the ones with single body made with fiberglass and therefore easily repairable (bodies made with ABS are indeed not very diffused anymore because of their difficult reparation processes). 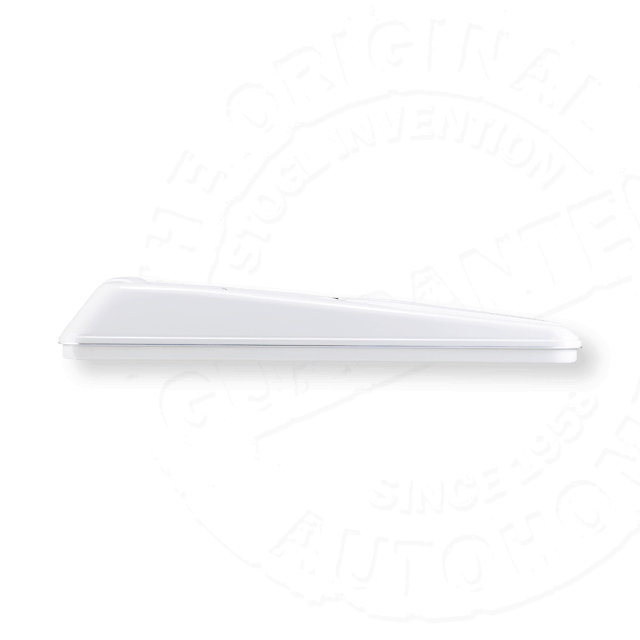 Thanks to its excellent qualities of lightness, robustness and resistance to decompression, fiberglass is also used for windmill blades and within the aeronautical and aerospace industry. 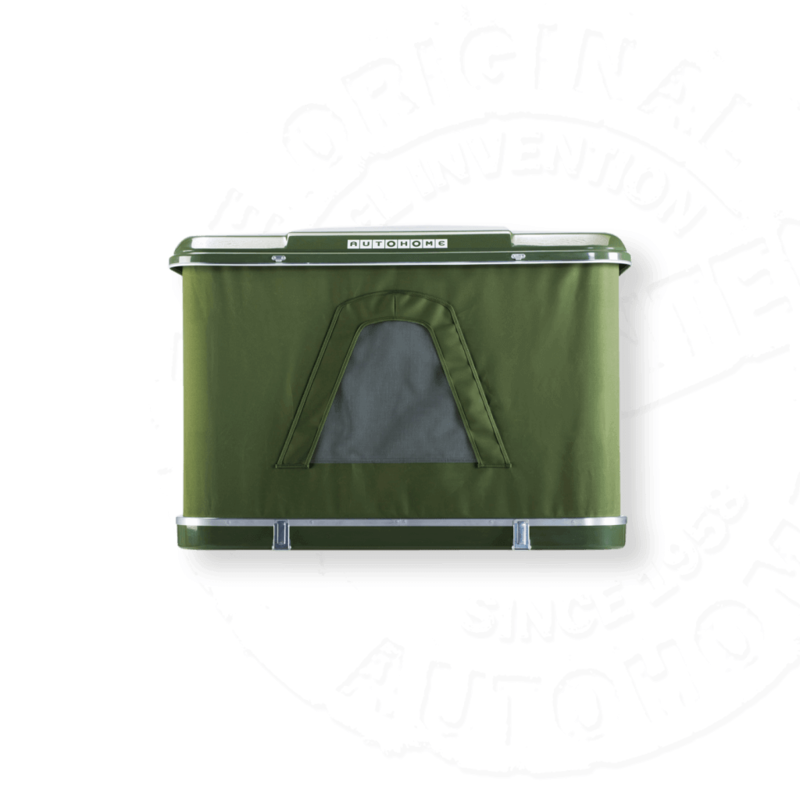 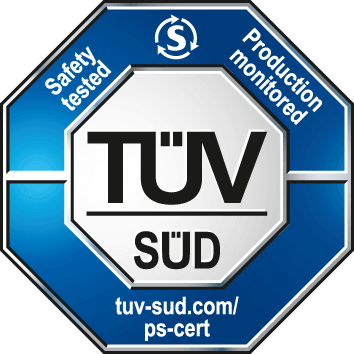 All particulars, from the design concept, materials and components, to the safety features and insulation, have been methodically chosen and thoroughly tested in order to obtain an all-weather proof product that can be depended upon at all times. 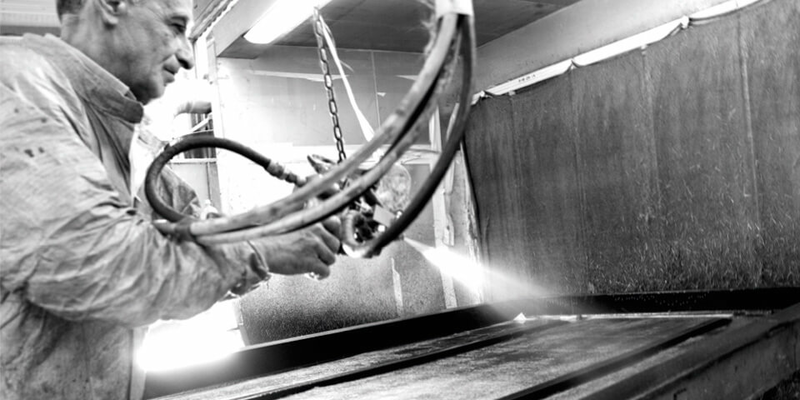 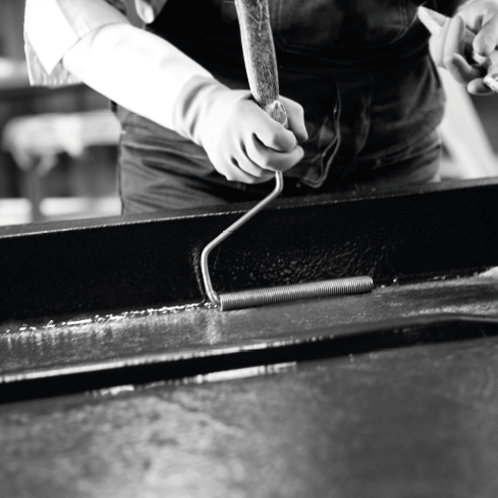 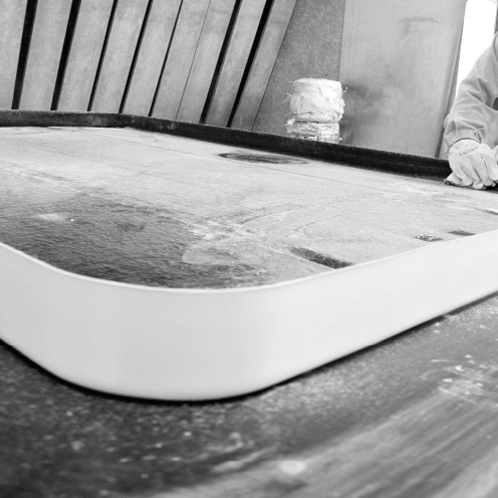 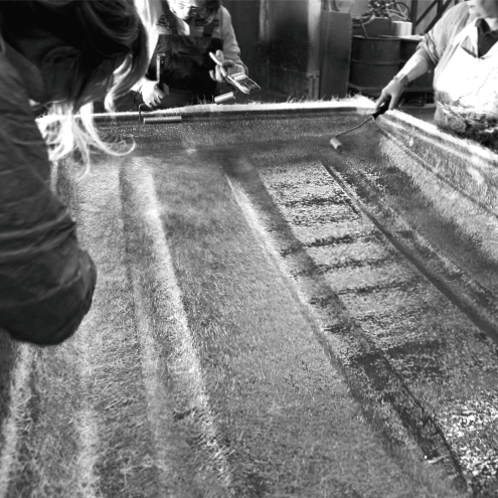 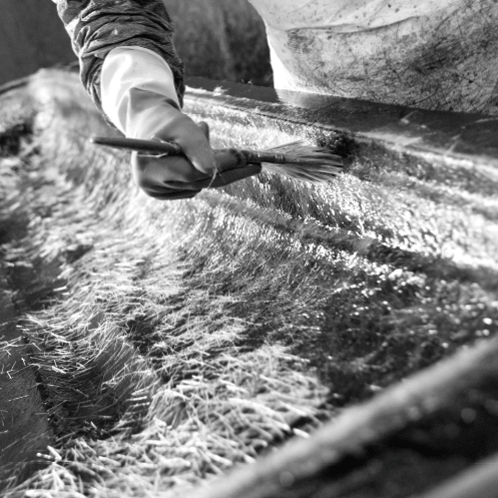 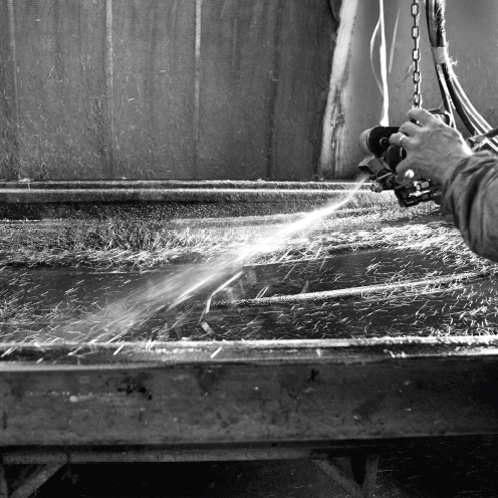 Just like the structure of a boat, we have used fibreglass to prevent it from aging, discolouring or losing its shape. 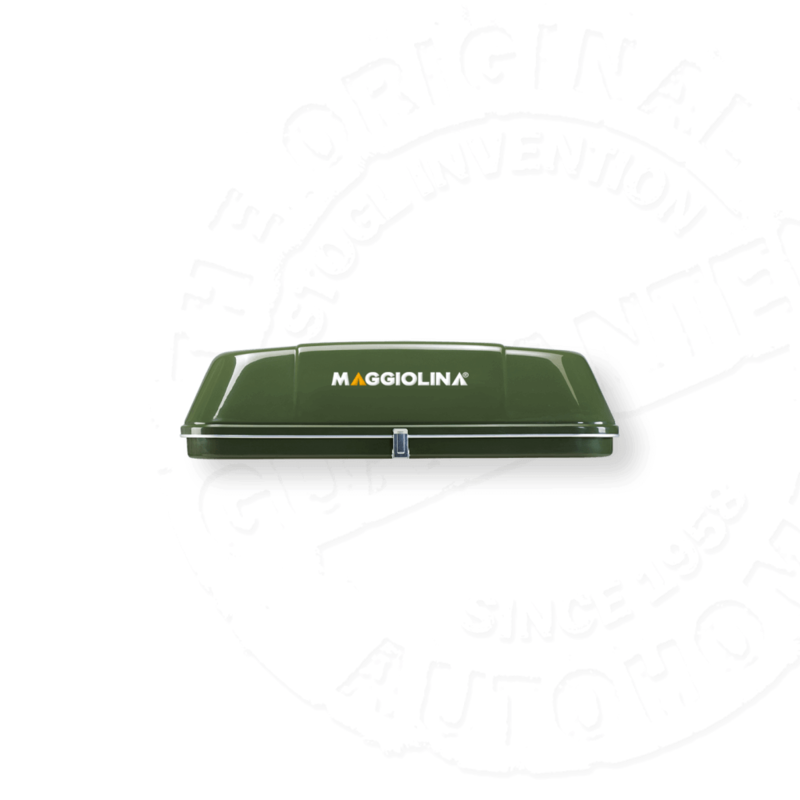 Its remarkable capacity to withstand knocks and bumps can ensure durability but should the worst happen Maggiolina is easily repaired. 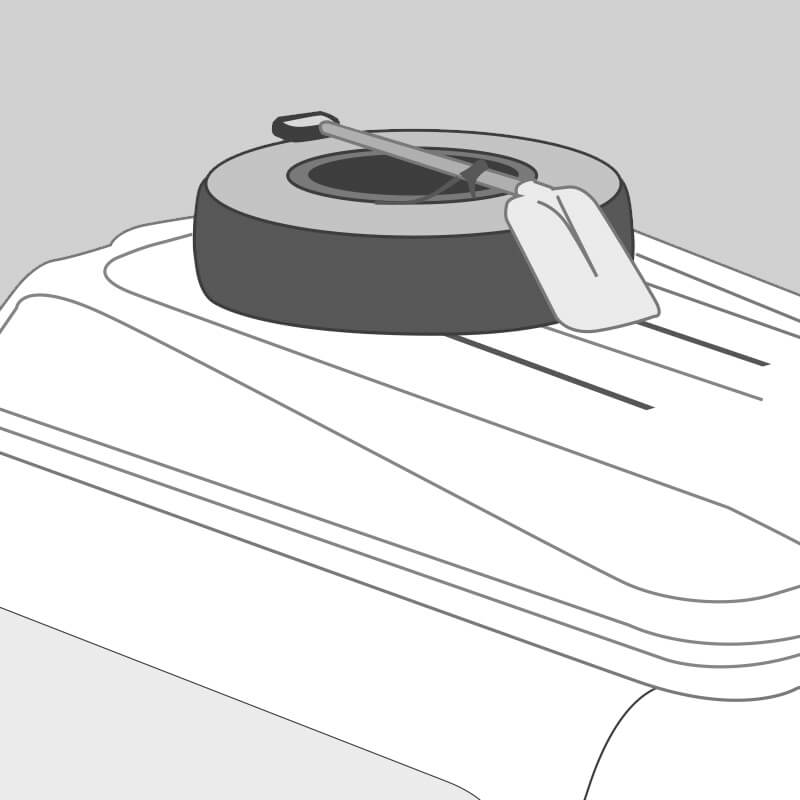 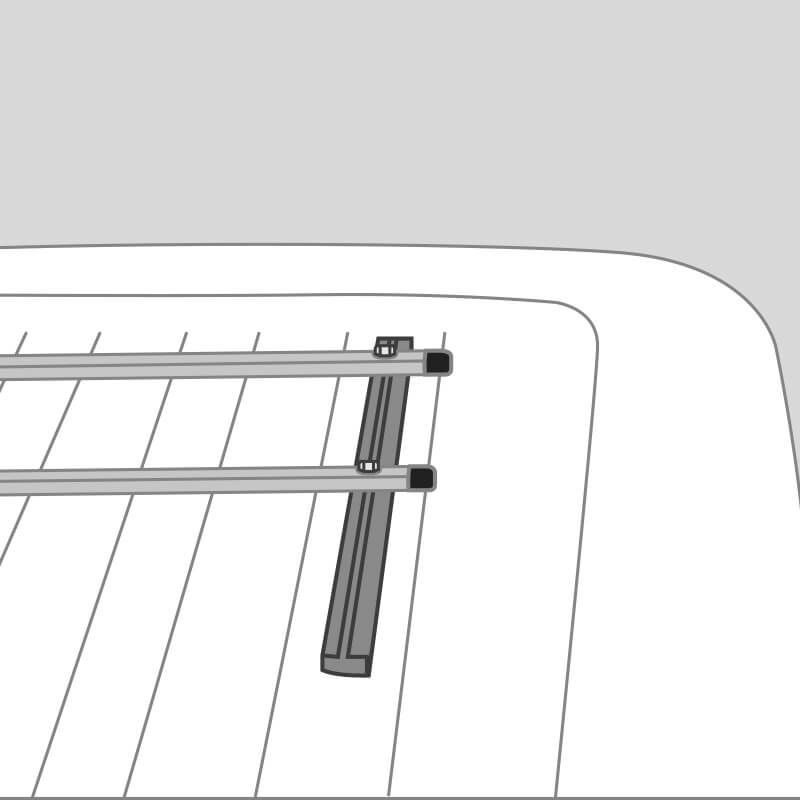 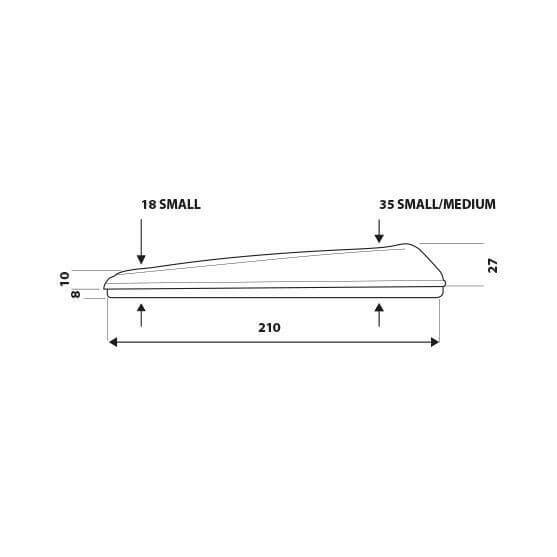 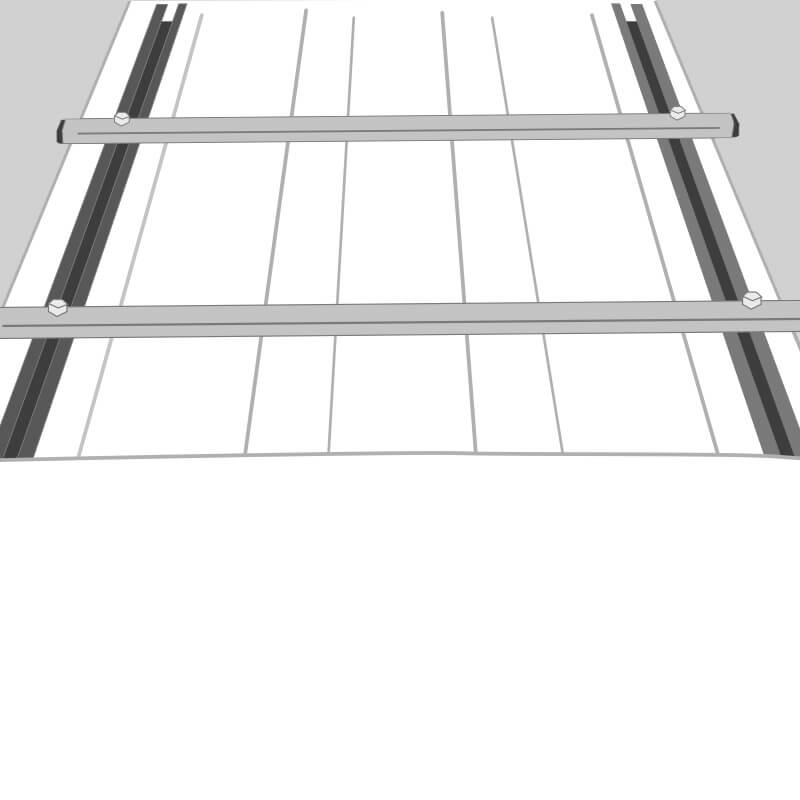 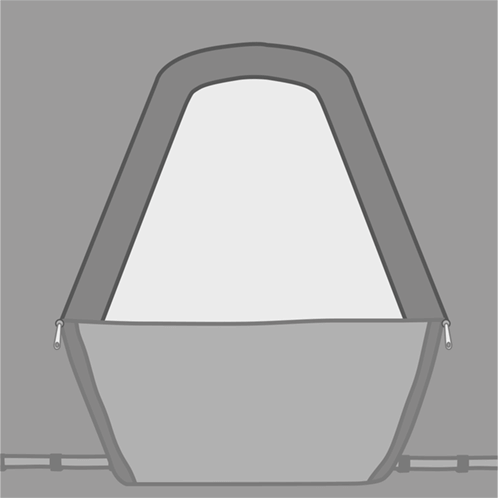 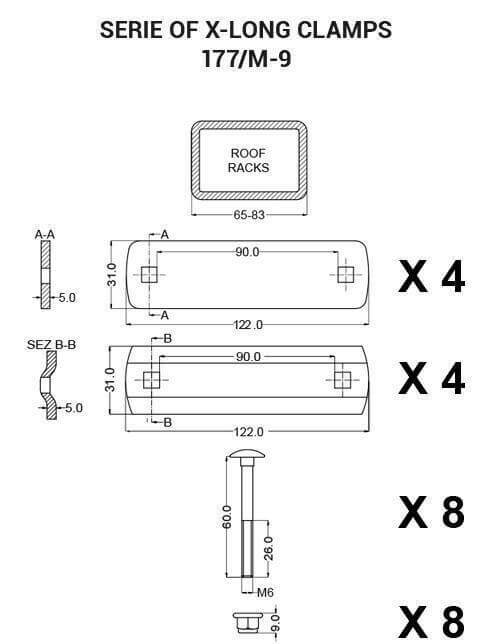 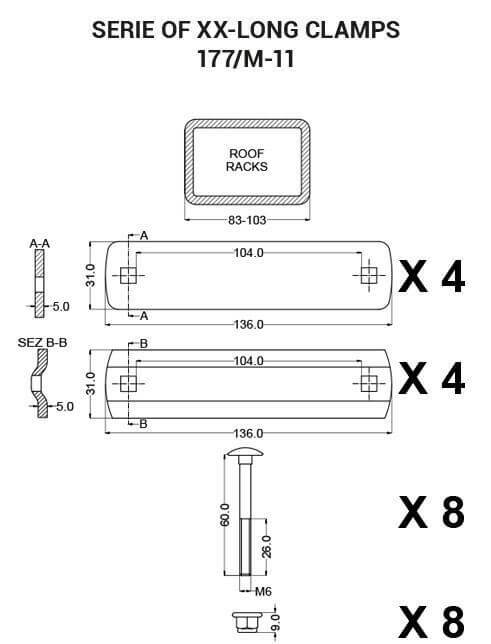 The “sandwich” construction base has 25mm insulation thickness, while the two “C” shaped built in guides allow easy installation of roof tent with any kind of roof cross bars (normally without any additional fixings) offering a steady and safe structure in order to withstand any off-road stresses. 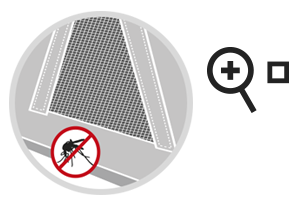 The mosquito net used is in fibreglass, soft and very resistant. 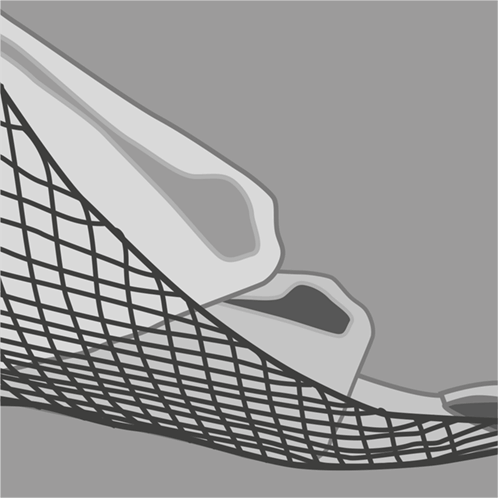 It has a fine weft: 18×20 threads per square inch. 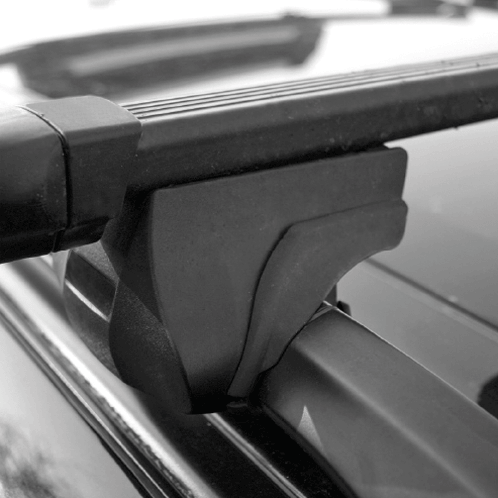 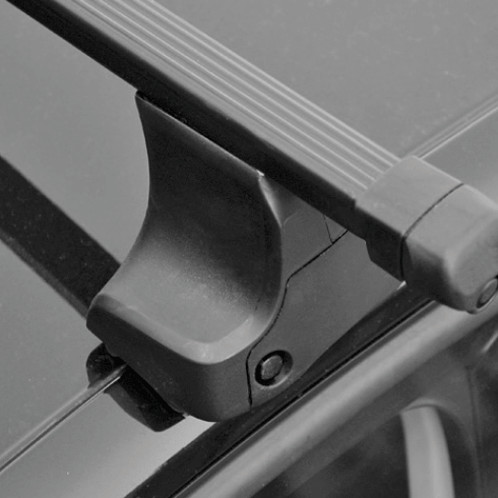 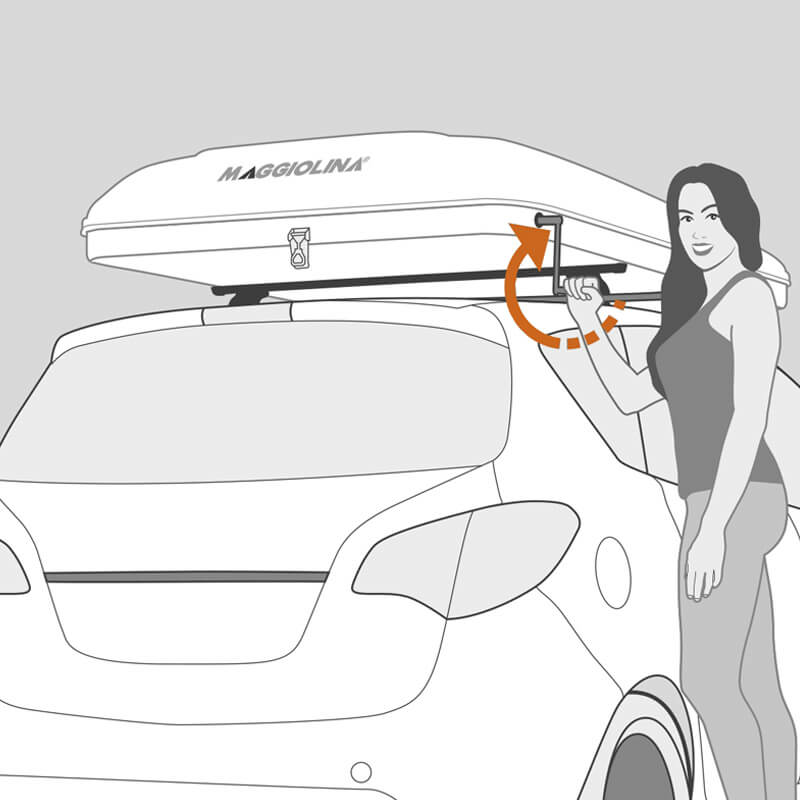 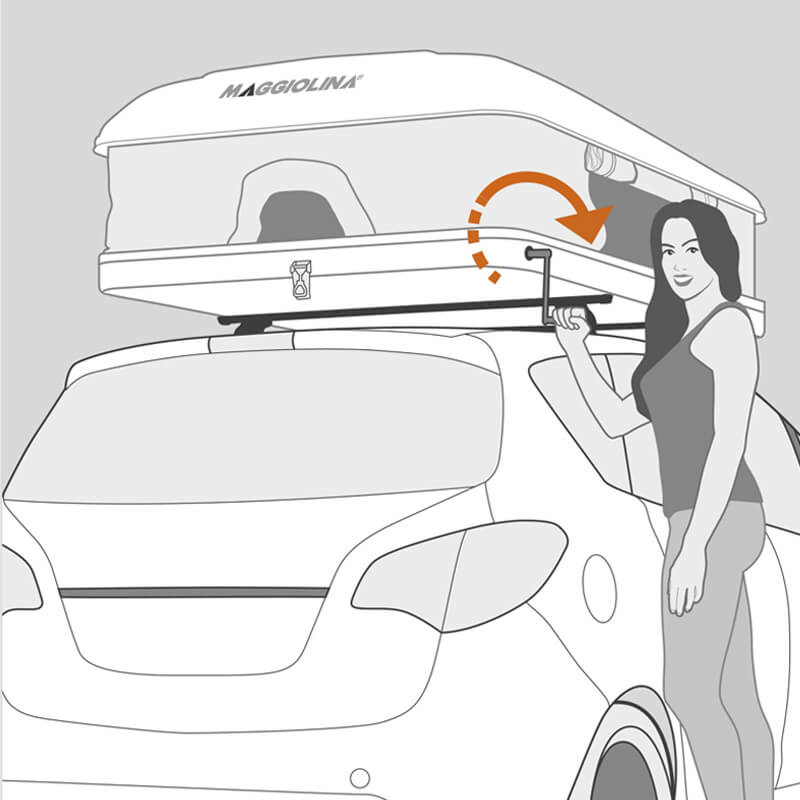 With the special “C” shaped guides built into the top, you can fit specific roof racks to hold items such as canoes or surfboards without any additional attachments. 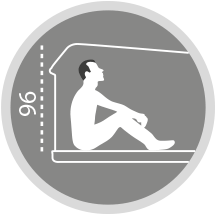 Max 25 kg.